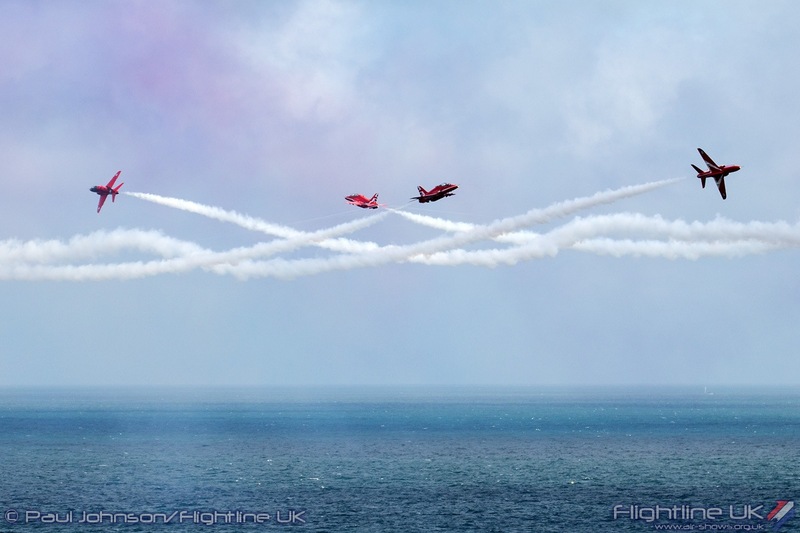 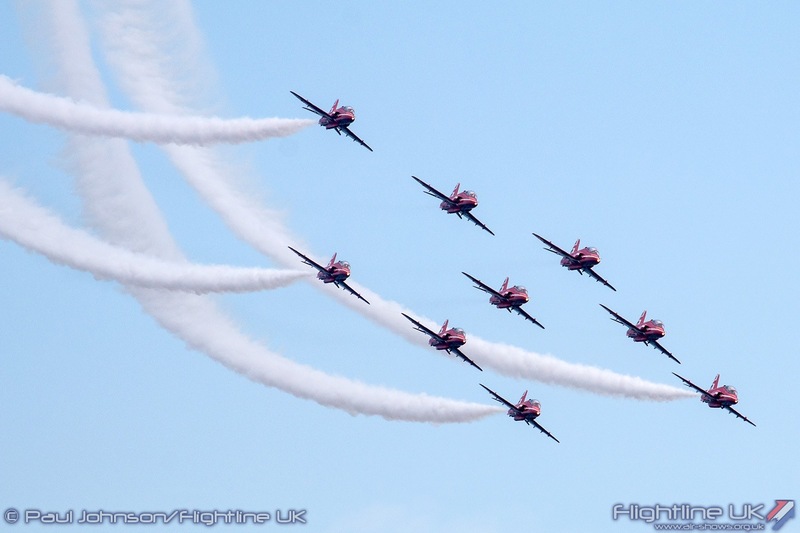 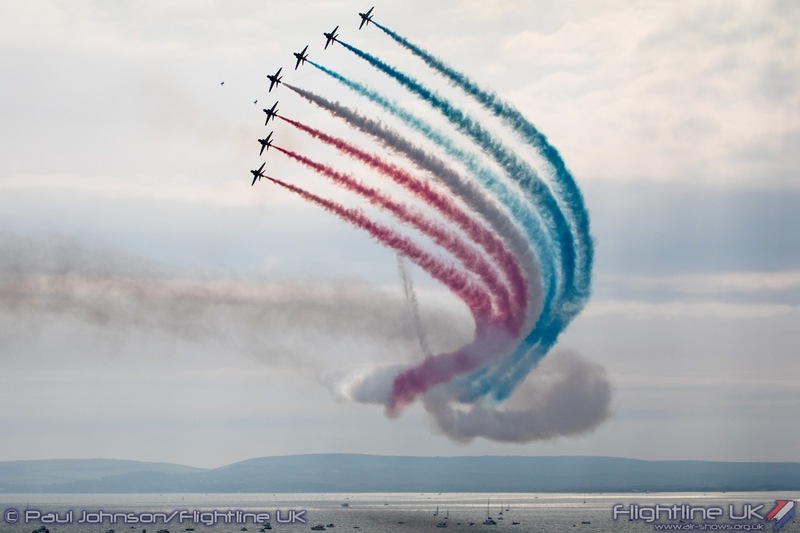 Second of the big four day airshow extravaganzas on the South Coast is the Bournemouth Air Festival. 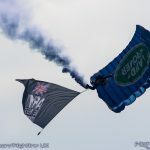 Like Eastbourne the week before, the event runs from Thursday through to Sunday offering entertainment throughout the day and into the evening for the first three days. 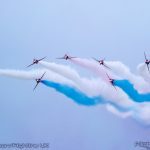 With a long coastline and beach, there is plenty to see and do with flying displays, a massive armed forces village, moored vessels from the Royal Navy and live music stages at both Boscombe and Bournemouth Piers. 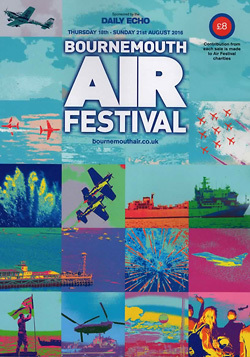 The large sandy beaches and cliff top promenade of Bournemouth’s East Cliff provide the location for four days of festivities and air displays. 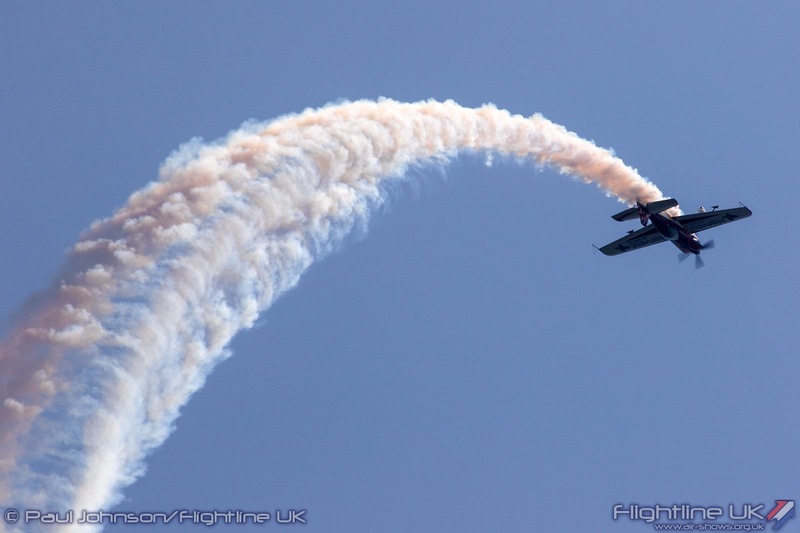 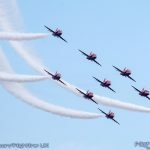 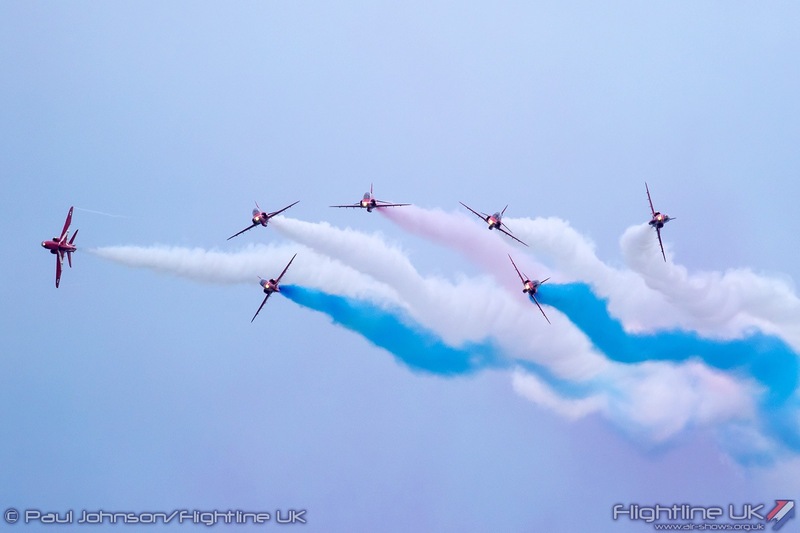 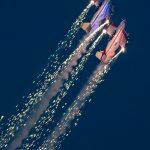 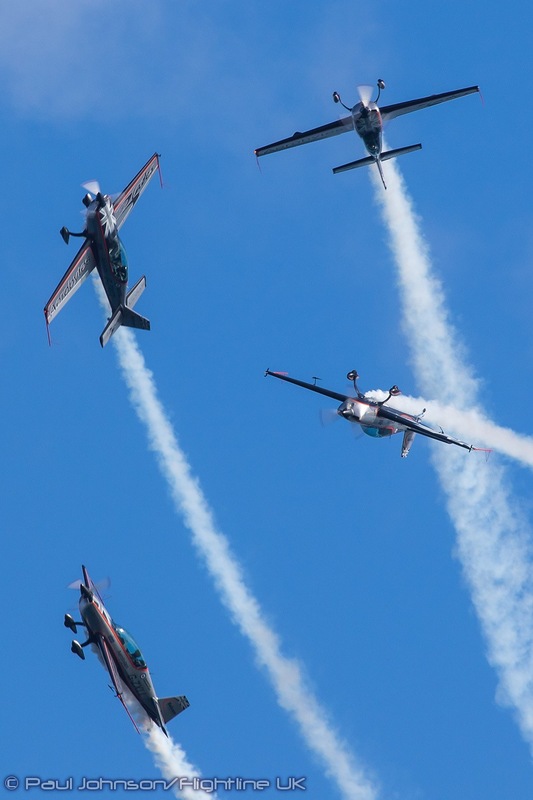 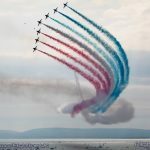 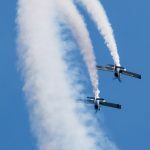 The Bournemouth Air Festival is now only in its ninth year, but has become one of the big names on the UK air display circuit. 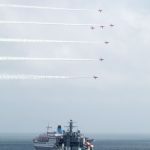 It attracts absolutely massive crowds, particularly at the weekend and fills Bournemouth’s hotels well in advance for the Air Festival week. 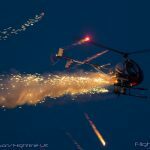 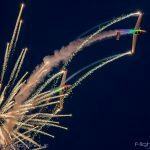 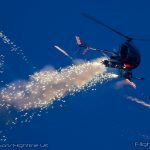 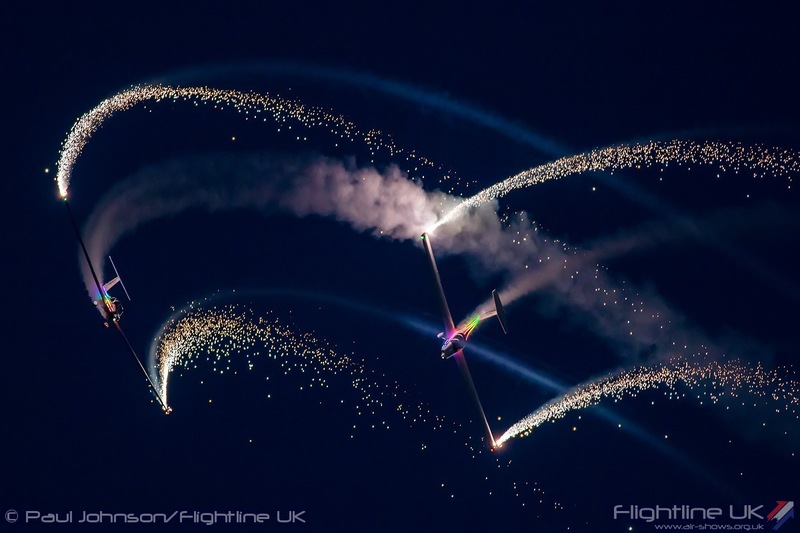 While the flying display remains the centrepiece to the event, Bournemouth offers varied entertainment throughout the day and well in to the night. 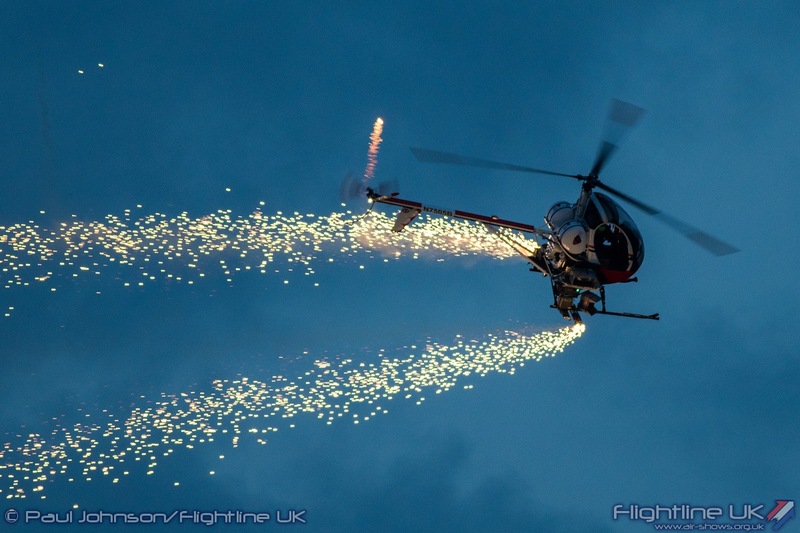 The now traditional “Night Air” dusk flying displays are augmented by two big concerts at either end of the festival site which play well into the evening. 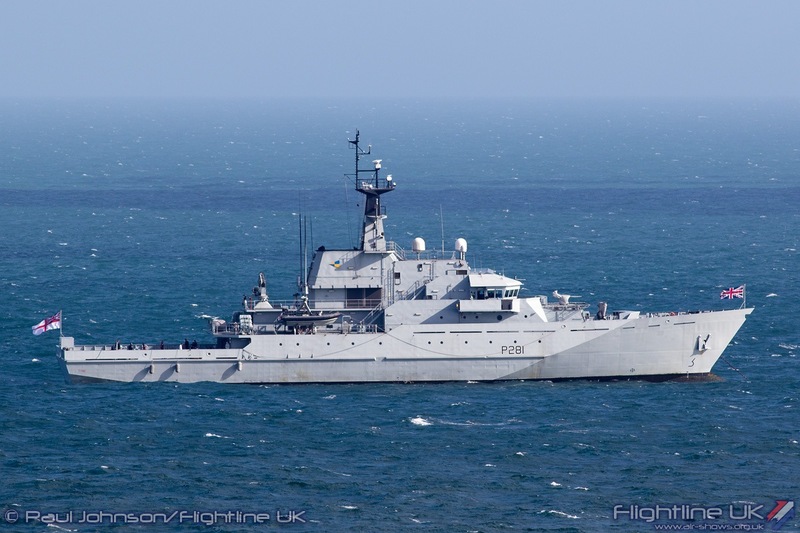 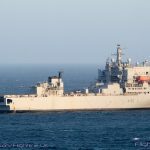 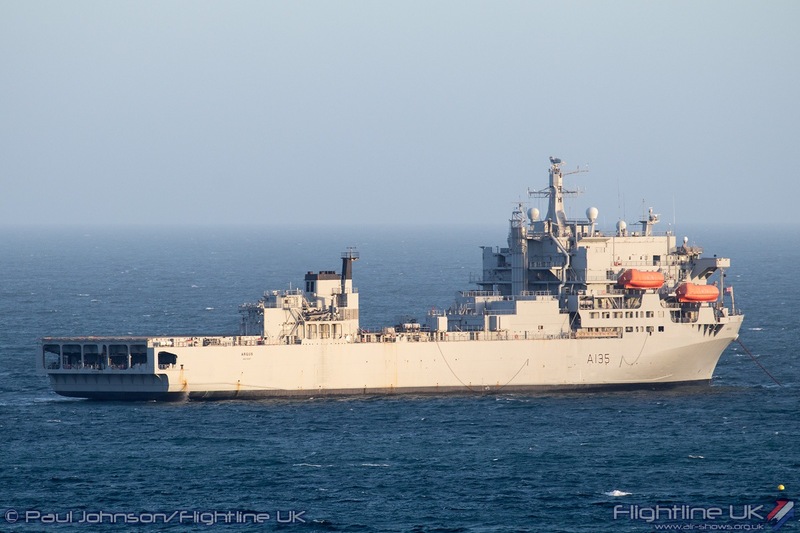 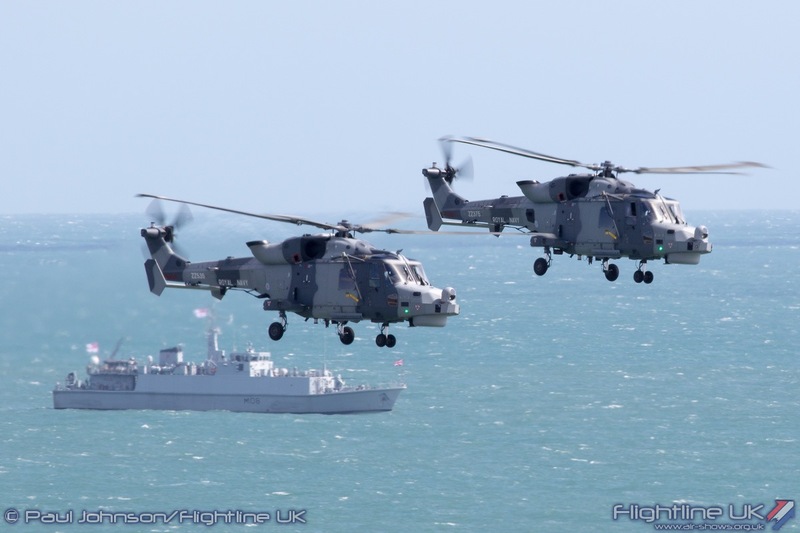 Visitors can also book tours to visit one of the Royal Navy ships that moor off the Bournemouth coastline for the duration of the Air Festival, This year these included RFA Argus, HMS Monmouth, HMS Tyne, HMS Grimsby, the French Navy’s FNS Sagittaire plus supporting training ships and coastal patrol boats. 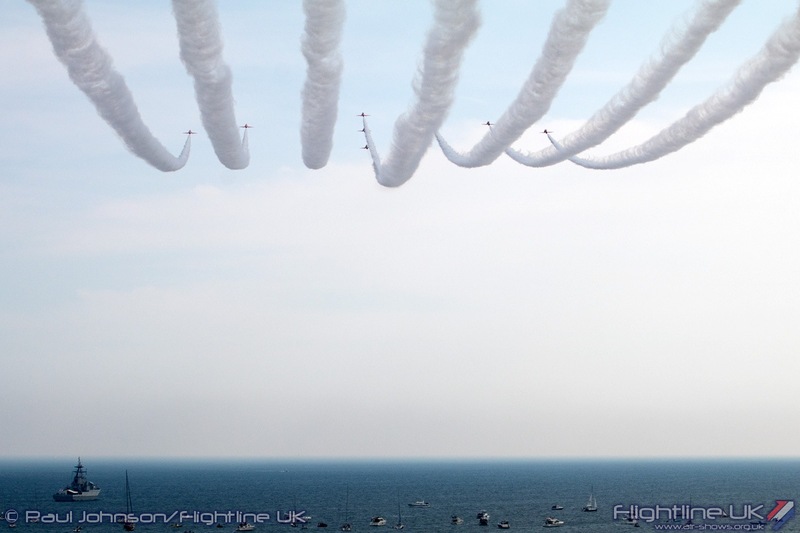 The Bournemouth coastline offers up some different vantage points to watch the displays. 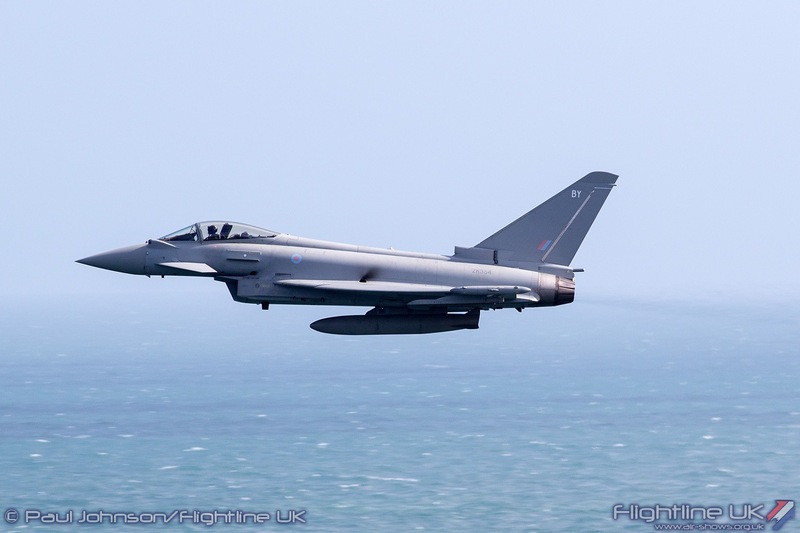 The beaches, newly redeveloped with larger areas of sand, are very popular locations. 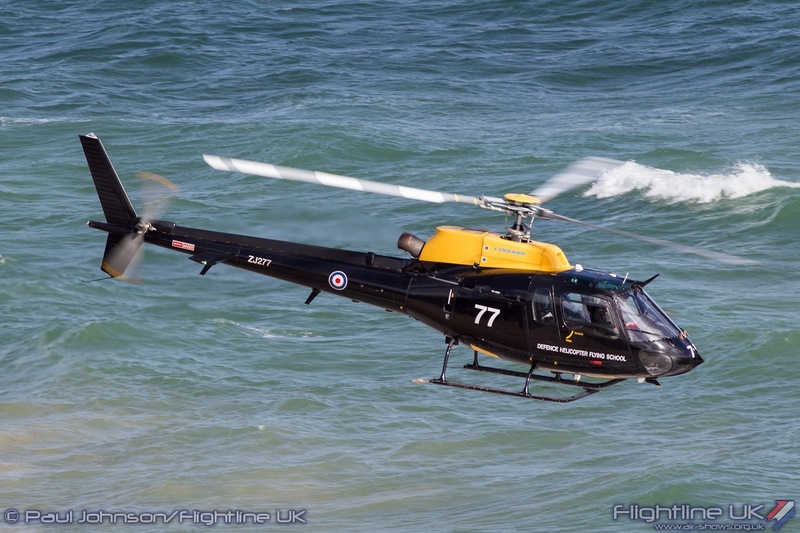 However, great views can be found from the East Cliff promenade in front many of Bournemouth’s hotels. 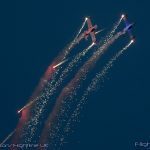 Sadly this year, the Air Festival faced very significant challenges thanks to a very short, but destructive spell of stormy weather. 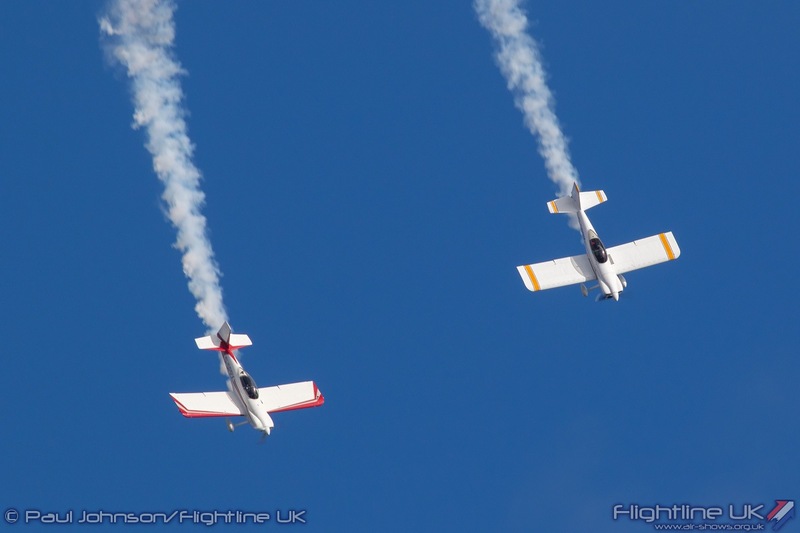 Thursday saw perfect blues skies, but Friday dawned to some very wet weather which delayed the start of flying. 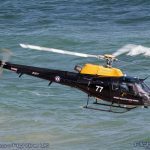 Overnight into Saturday, some very high winds and high tides set in forcing the early evacuation of the two concert areas at Boscombe and Bournemouth Piers and causing damage to much of the beachfront showground area. 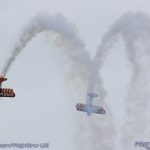 Saturday remained very windy delaying flying until early evening while the Air Festival staff “recovered” the beachfront area ahead of the better weather forecast on the Sunday. 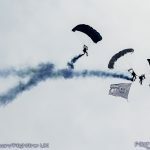 All in all, it was very challenging for all concerned but credit much go to everyone in making sure the Festival did run entertainment on all four days. 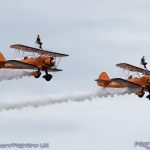 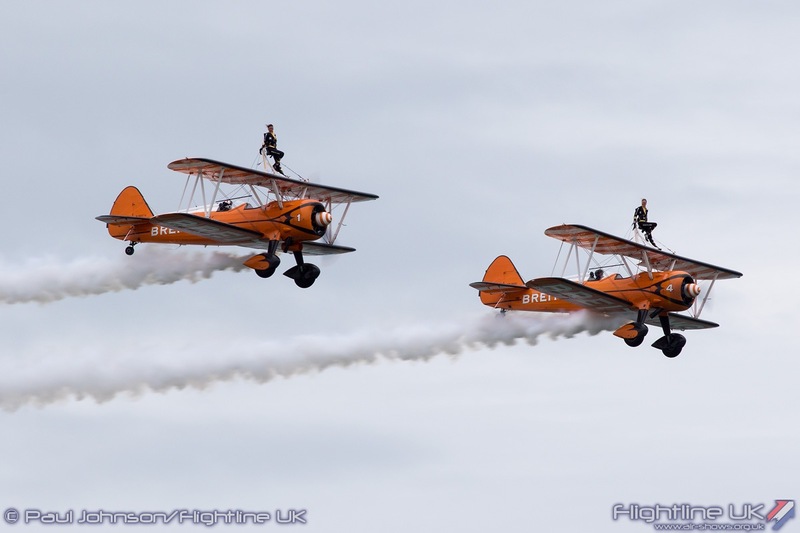 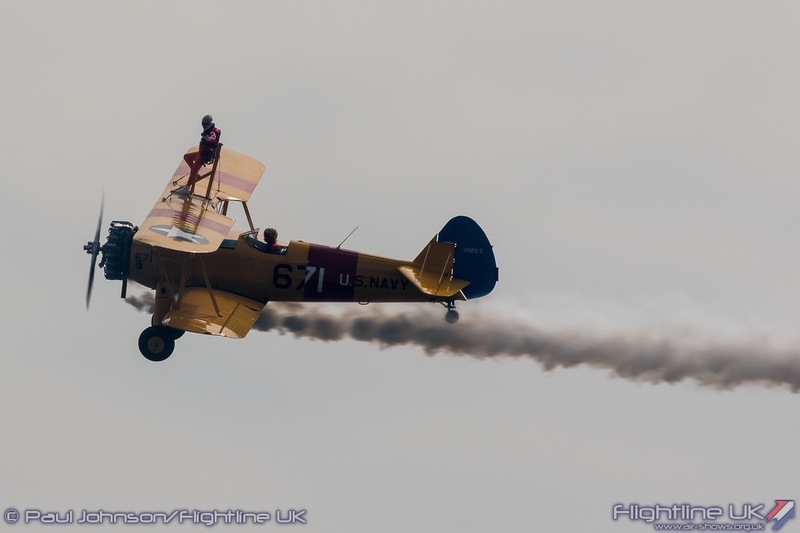 Opening the Festival flying displays on the Thursday was a charity wingwalk by pension Dawn Goodson. 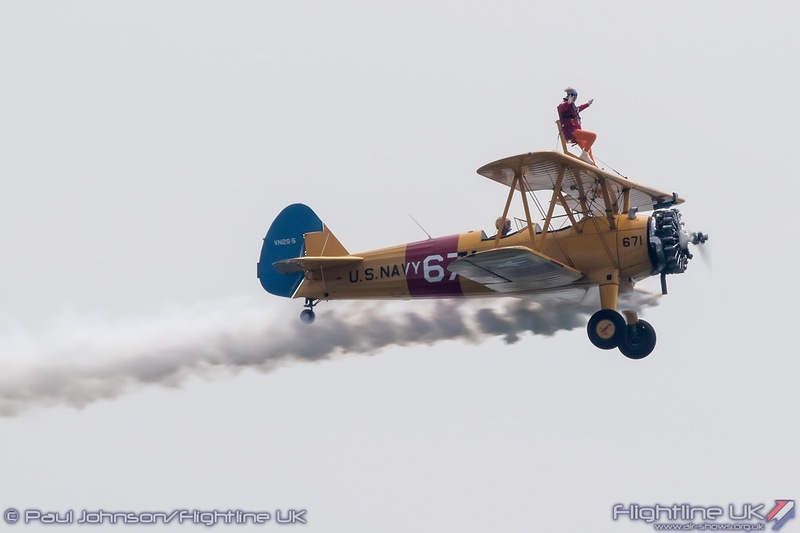 The 85 year old is a true dare-devil having got into numerous scrapes throughout her life. 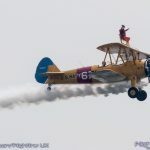 She joked that the only reason she was wingwalking on Mike Dentith’s classic Boeing Stearman was that officials had barred her from skydiving! 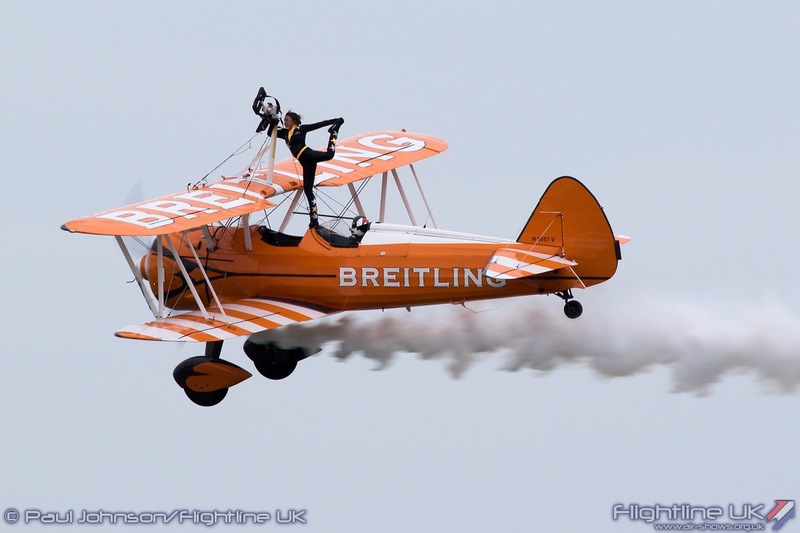 Her wingwalk helped raise funds for the Motor Neurone Disease Association (MNDA). 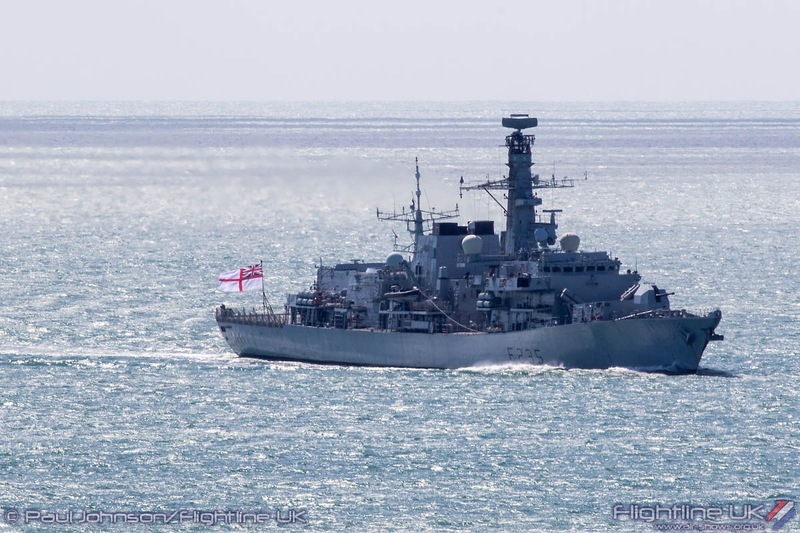 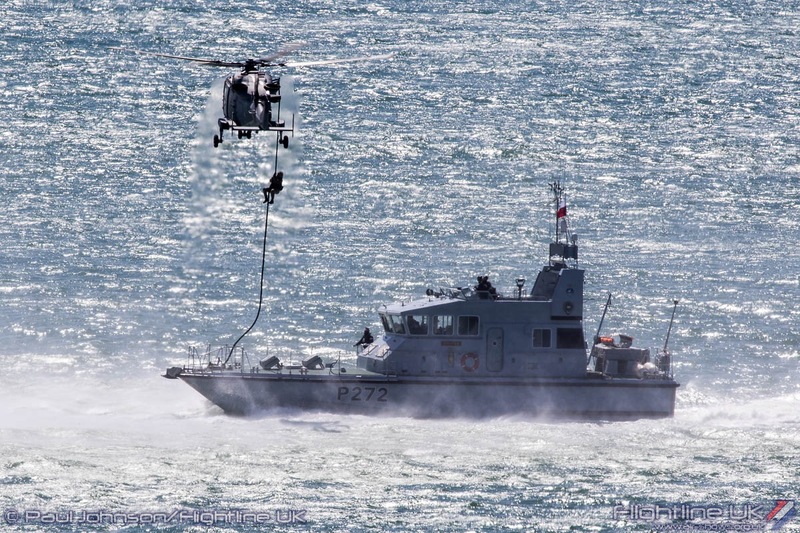 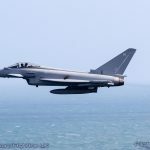 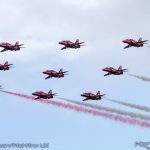 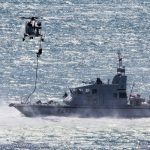 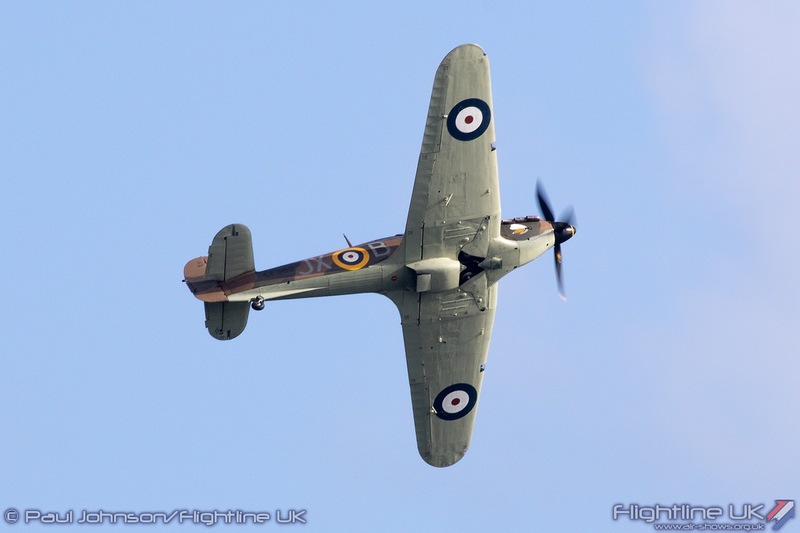 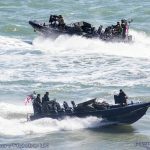 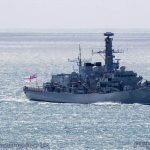 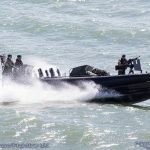 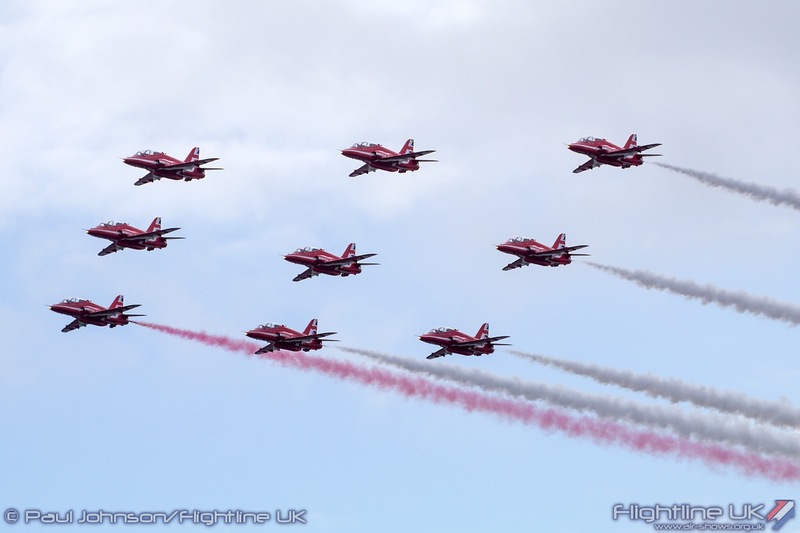 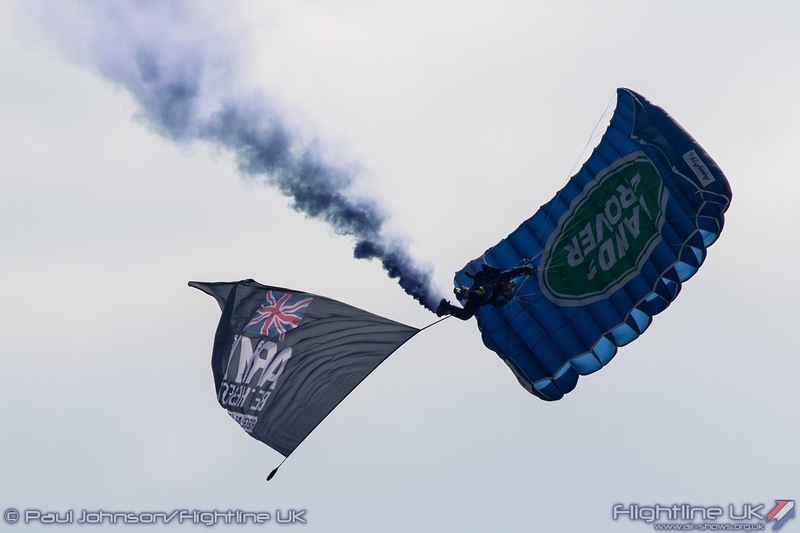 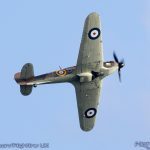 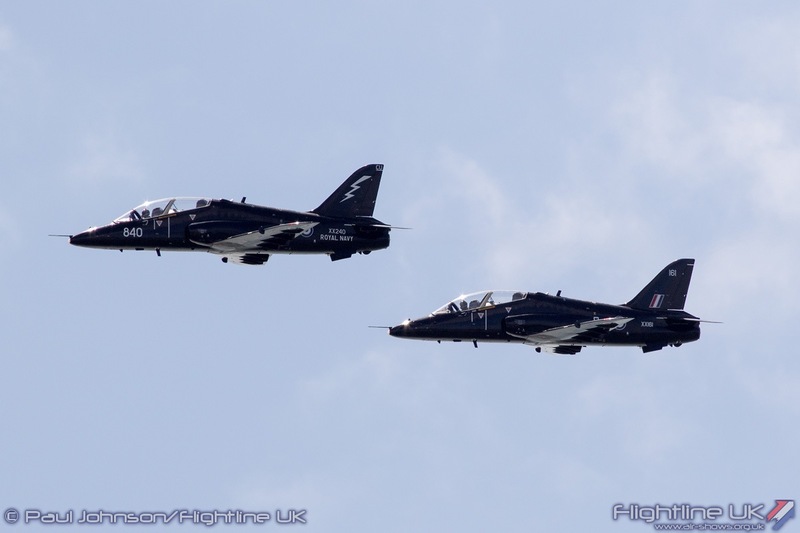 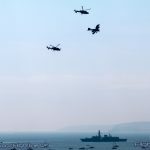 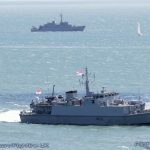 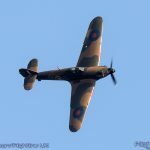 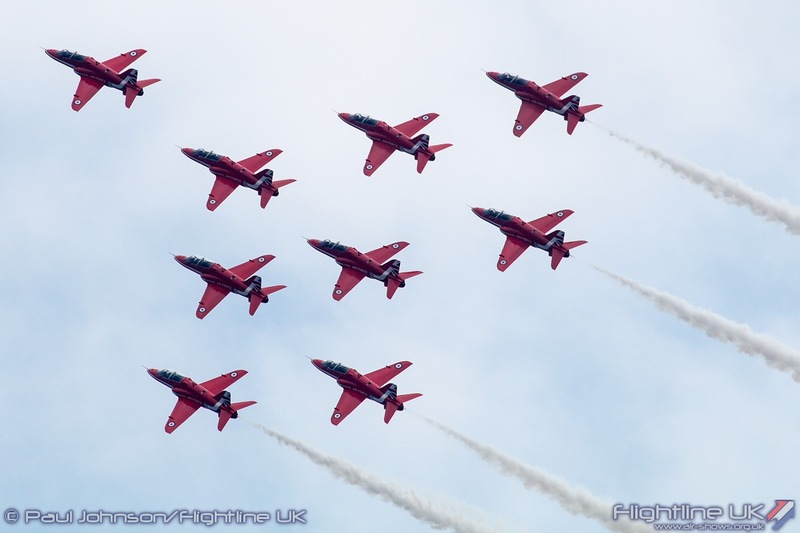 The UK Armed Services are at the centre of the Air Festival and with the exception of the military shows, Bournemouth has perhaps the largest “Villages” dedicated to the Royal Navy, British Army and Royal Air Force outside of the major military airshows. 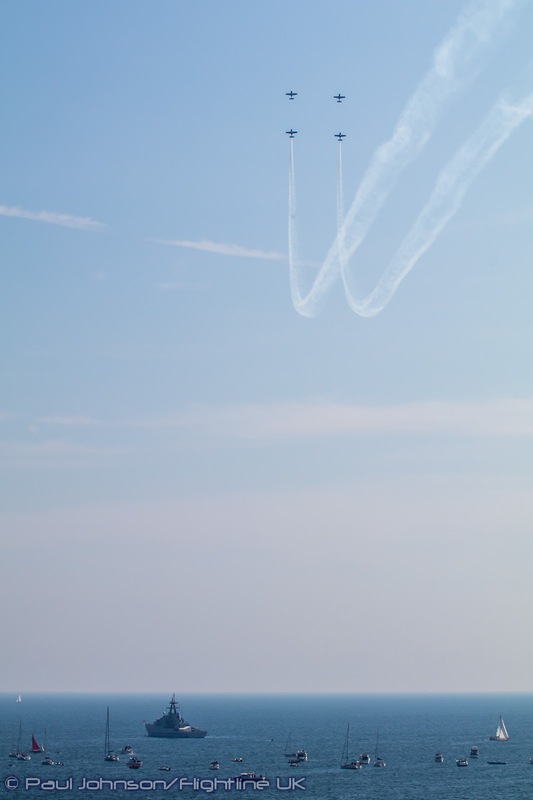 The large support on the ground is mirrored in the flying displays. 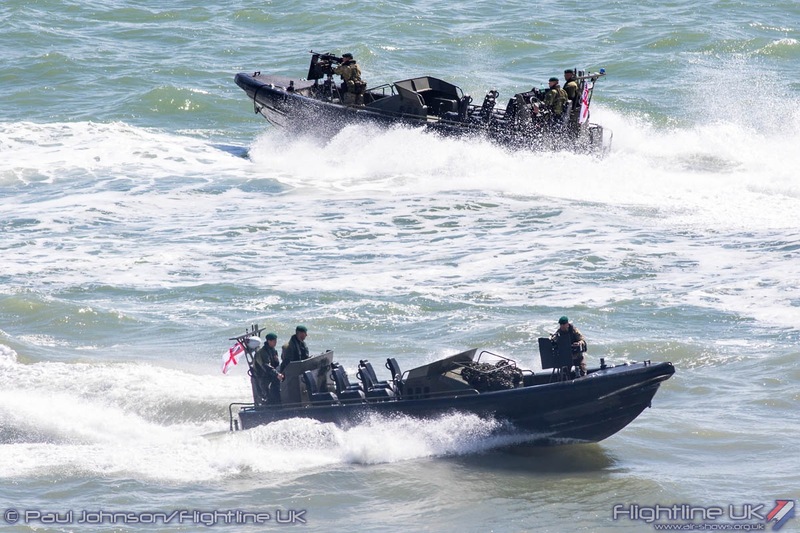 The main weekend show days are traditionally kick-started with a beach assault from the Royal Navy and Marines. 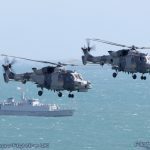 Despite the weather this did happen both days, though it was delayed on Saturday until late afternoon. 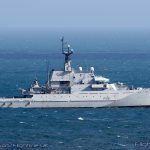 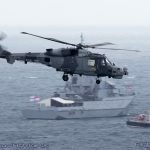 The demo not only involves the ships moored at sea, but also landing craft, land vehicles such as the Viking and aircraft. 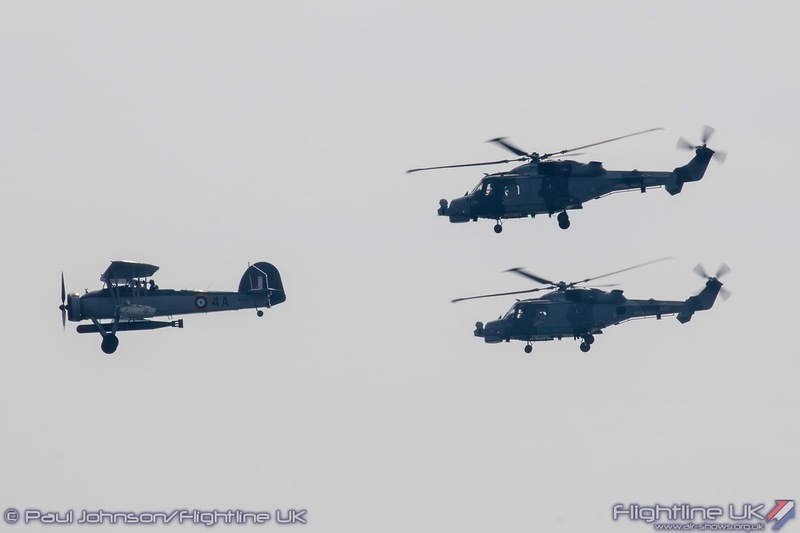 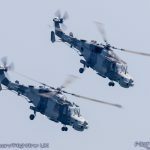 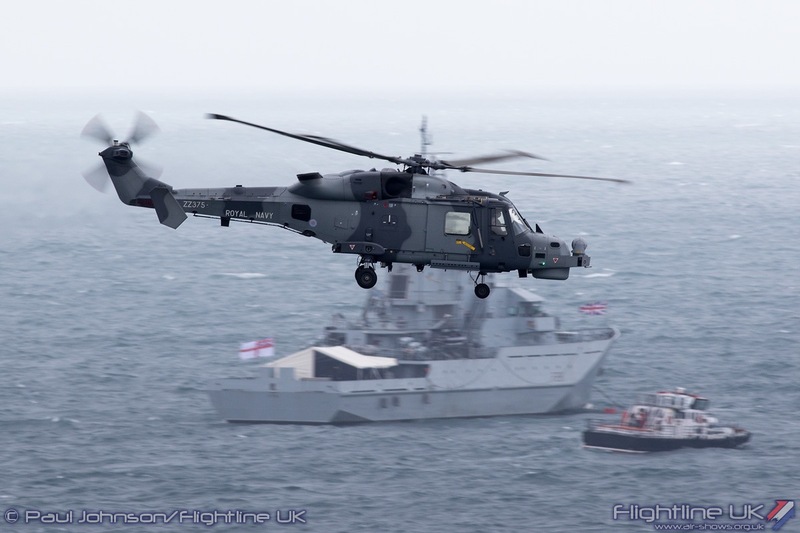 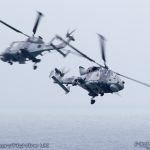 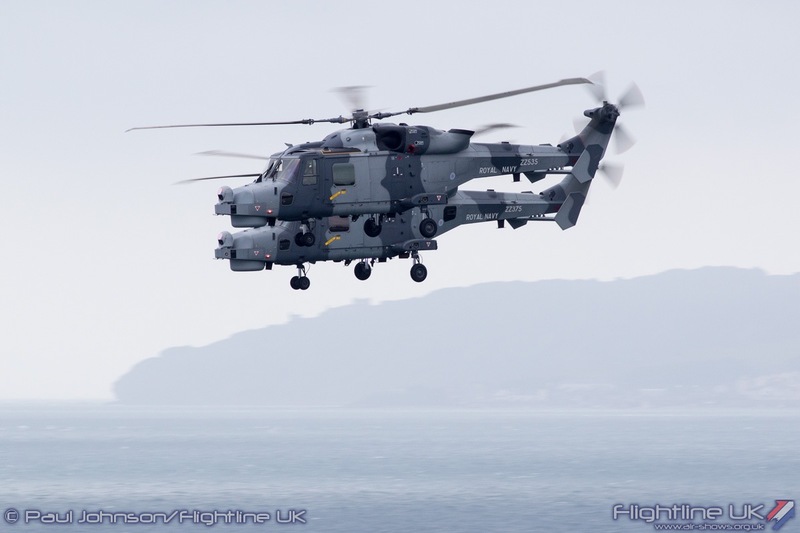 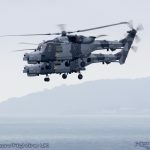 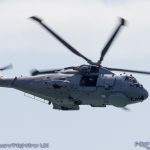 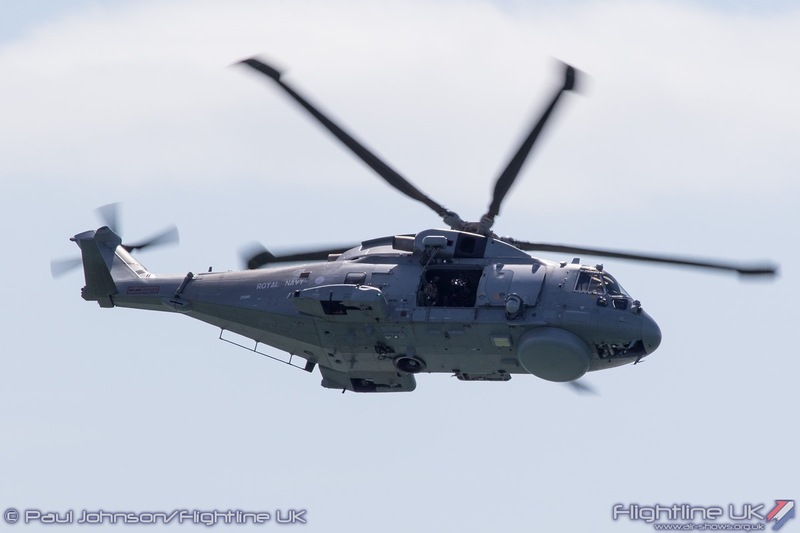 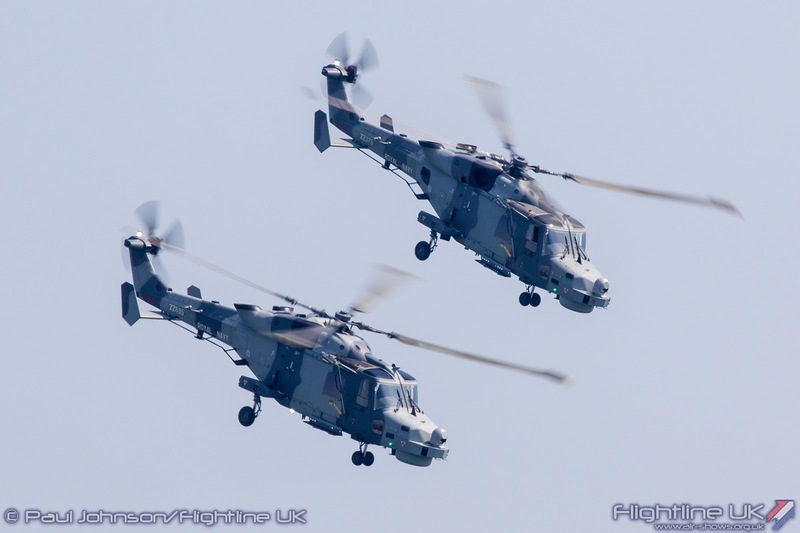 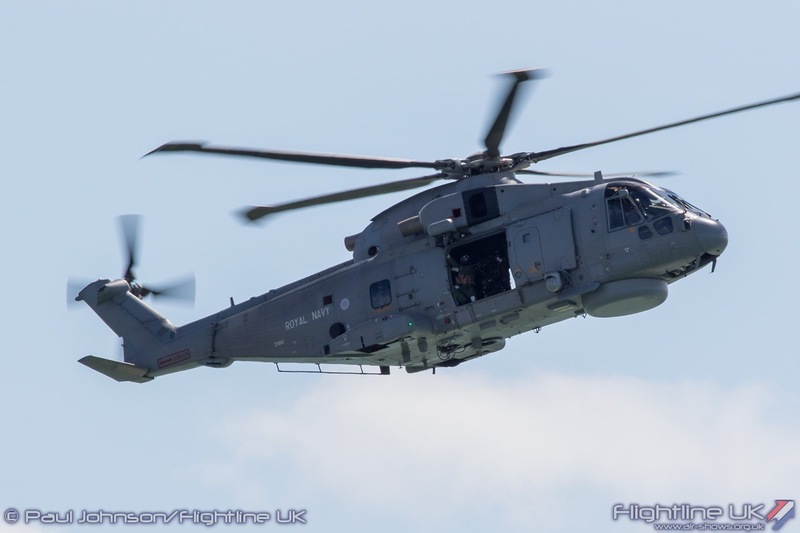 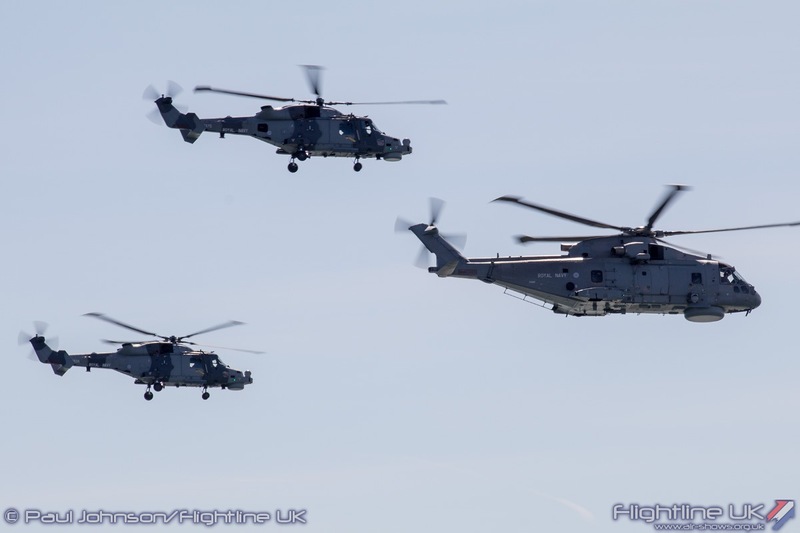 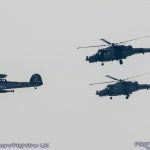 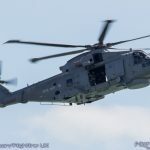 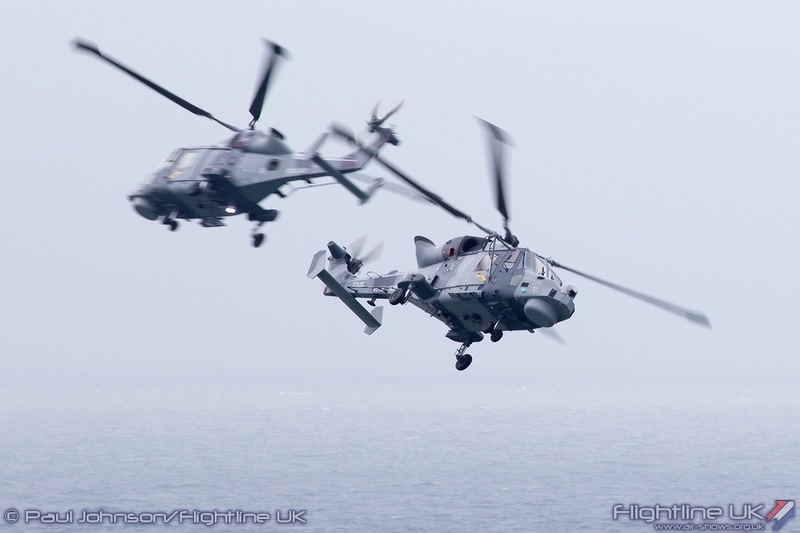 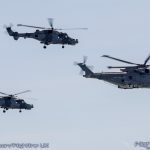 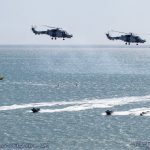 Flying in support this year were the pair of AgustaWestland AW159 Wildcat HMA2 helicopters of the Black Cats Helicopter Display Team, a AgustaWestland Merlin HM2 from RNAS Culdrose and a pair of BAE Systems Hawk T1s from 736NAS. 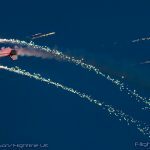 The Black Cats returned later each day for their own dramatic display routine, though Saturday’s inclement weather forced them down to just a solo display in the rapidly fading light. 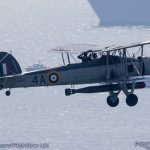 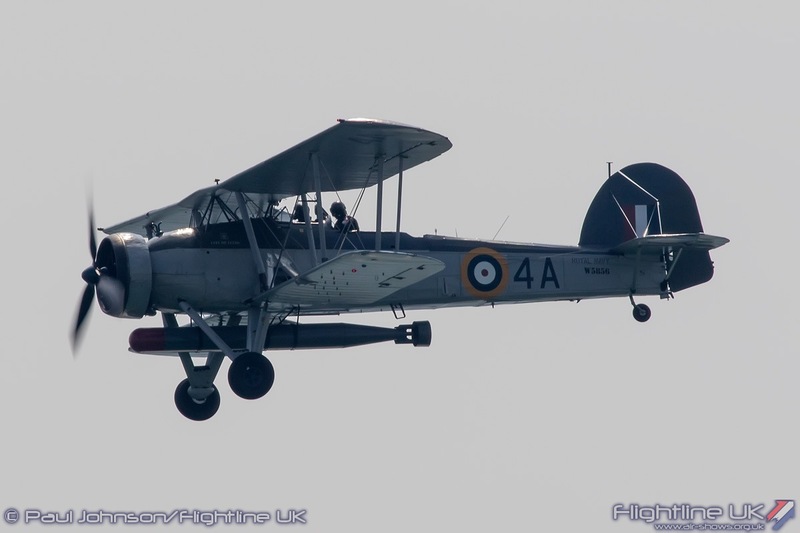 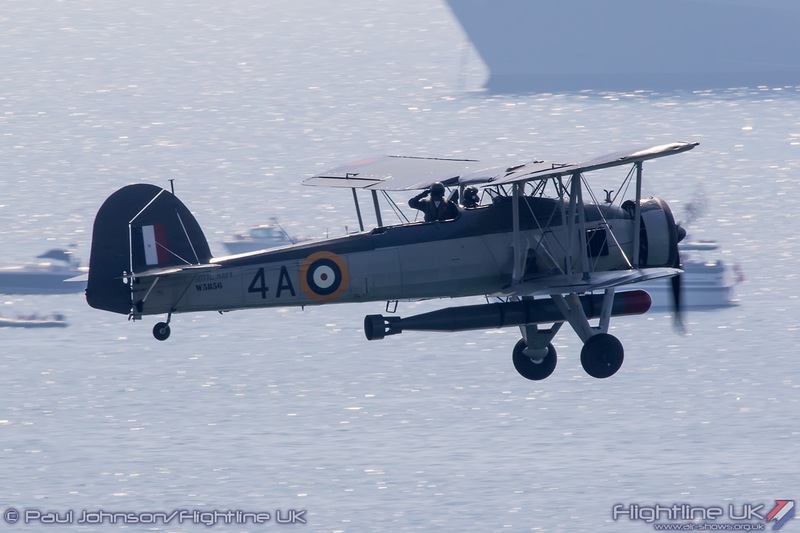 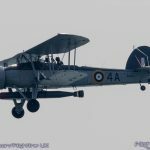 Thursday saw the team mark over 70 years of Naval Aviation History flying alongside the Royal Navy Historic Flight’s Fairey Swordfish. 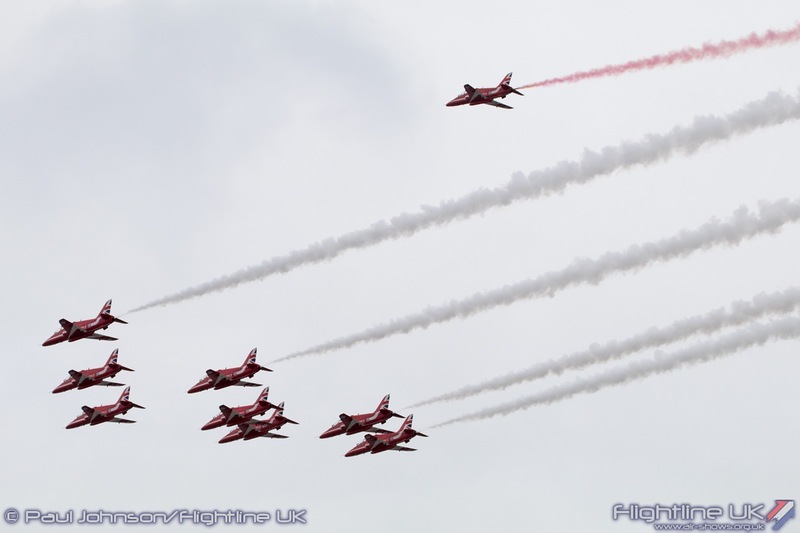 The Royal Air Force also had nearly all its display teams in attendance. The Red Arrows appeared on all four days which is quite a coup for the Air Festival Organisers ensuring large audiences each day despite the unsettled weather. 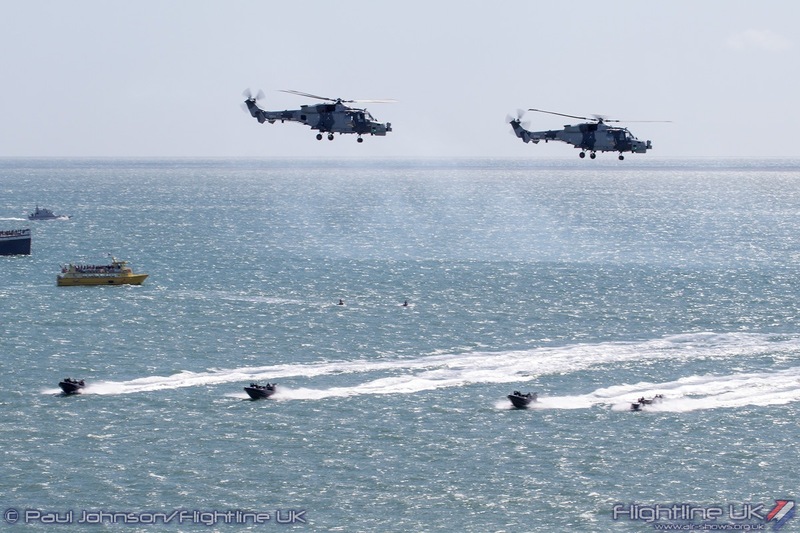 Bournemouth remains a very special place for the team. 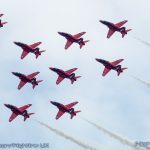 In the aftermath of Flt Lt Jon Egging’s accident at Bournemouth Airport , the town showed unwavering support for the team. 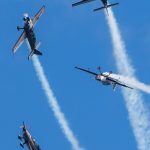 The Saturday of the Air Festival marked five years since that fateful day. 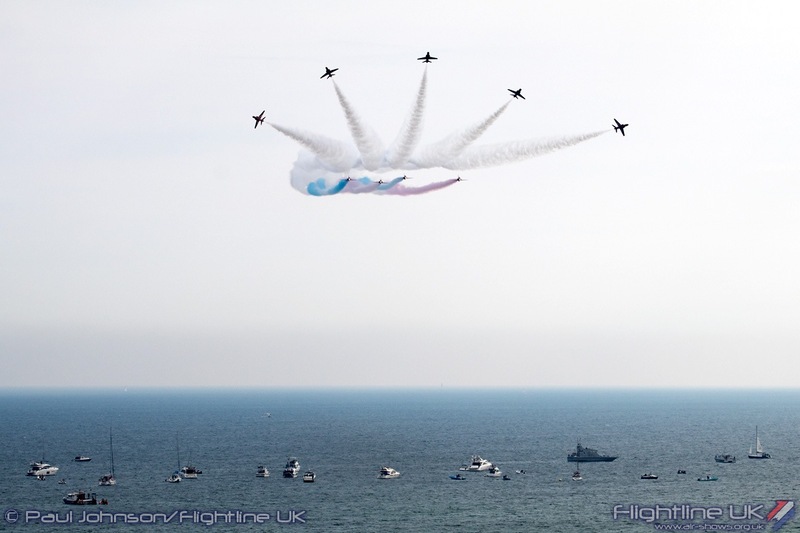 A special commemoration took place close to the Jon Egging Memorial (which is soon to be moved to a safer location away from a recent cliff fall) and the team also marked the anniversary with a very emotive missing man formation at the end of their display on Saturday. 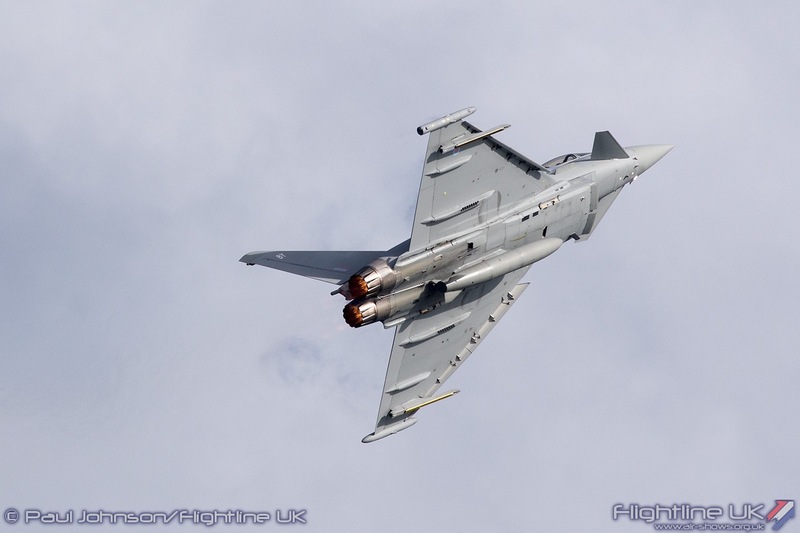 Flt Lt Mark Long made an impressive contribution to the flying in the Eurofighter Typhoon FGR4. 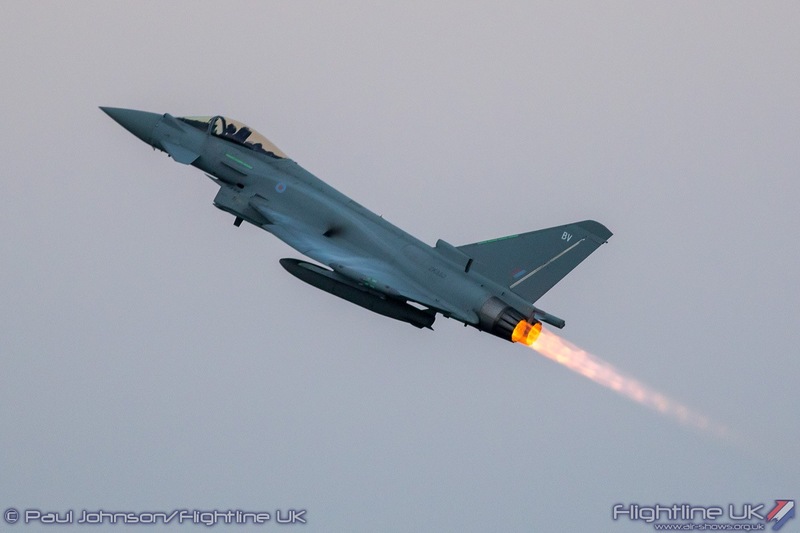 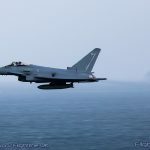 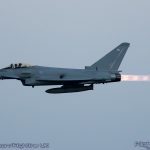 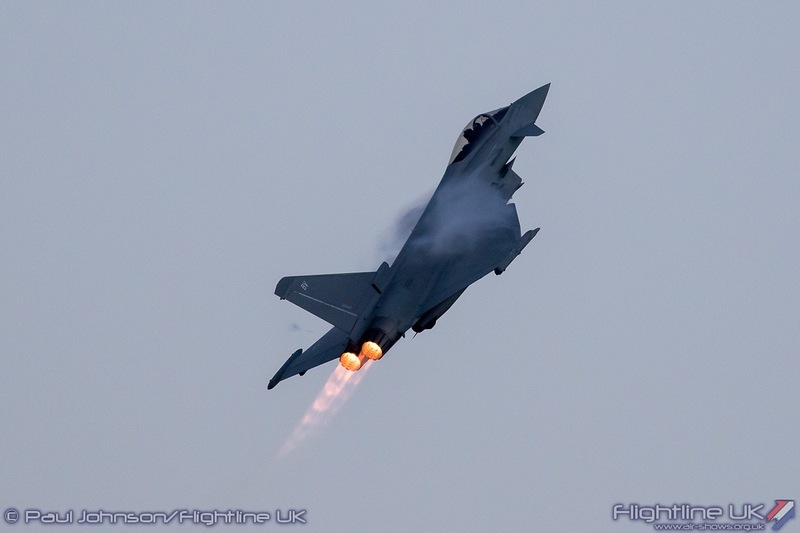 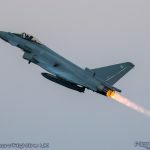 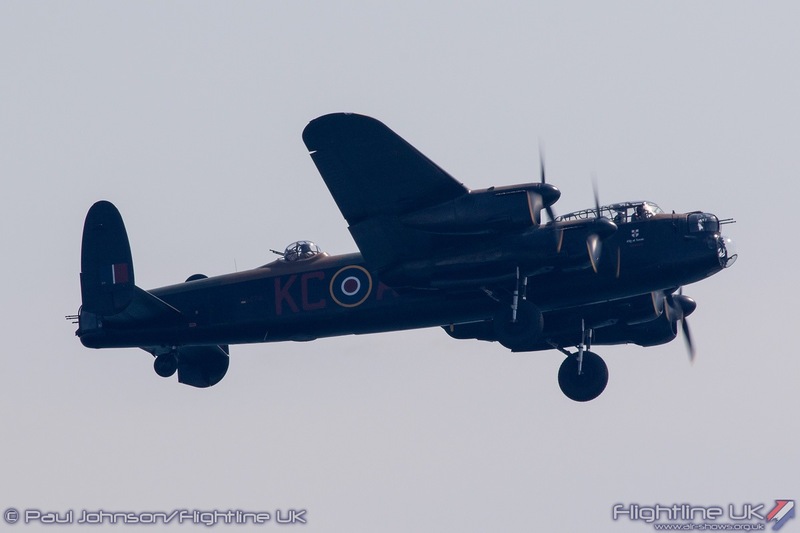 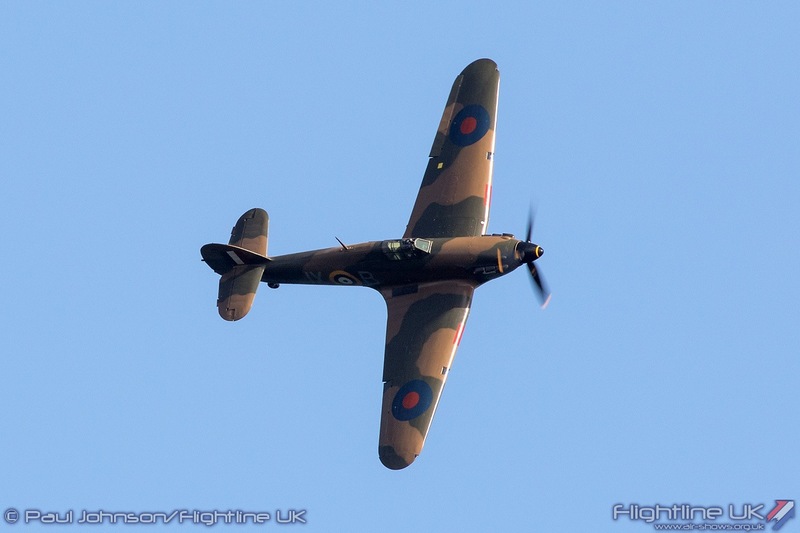 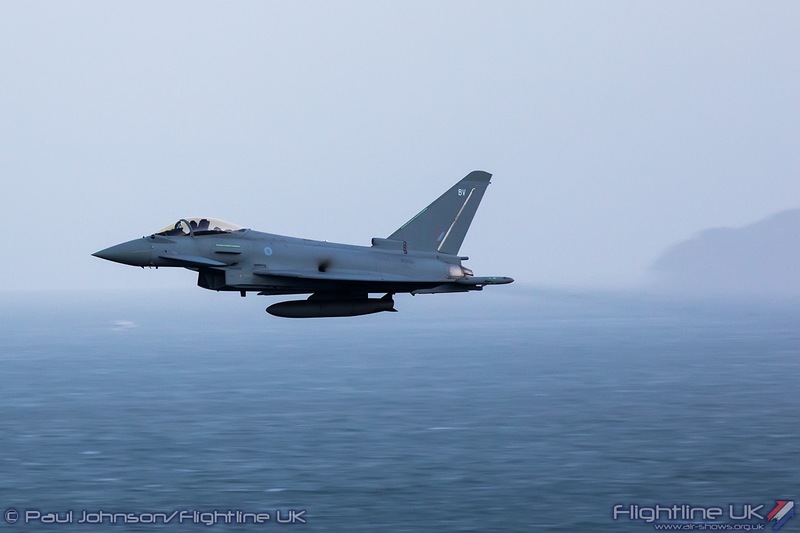 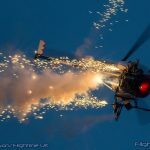 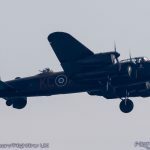 Not only did he fly in the main flying displays between Friday and Sunday, he also marked the Royal Air Force’s debut appearance as part of the Night Air Displays on Friday. 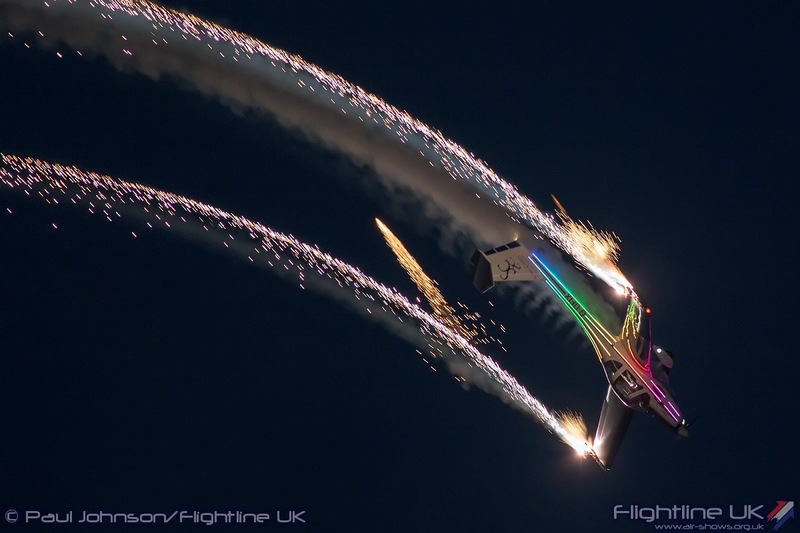 A sunset fast jet solo has been the missing link in Night Air for many years so it was good to see it finally happen. 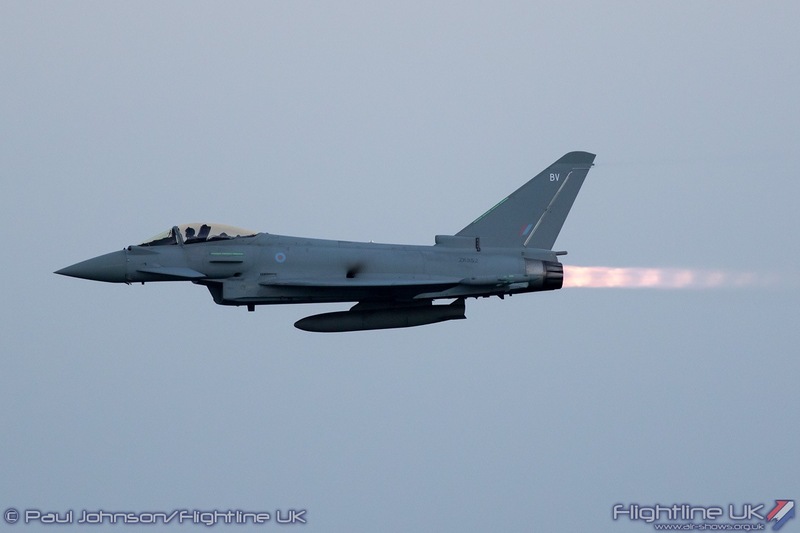 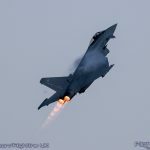 It may not be ideal for photographers, but there is nothing more dramatic that seeing the bright flames of reheat in low light during an air display. 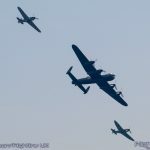 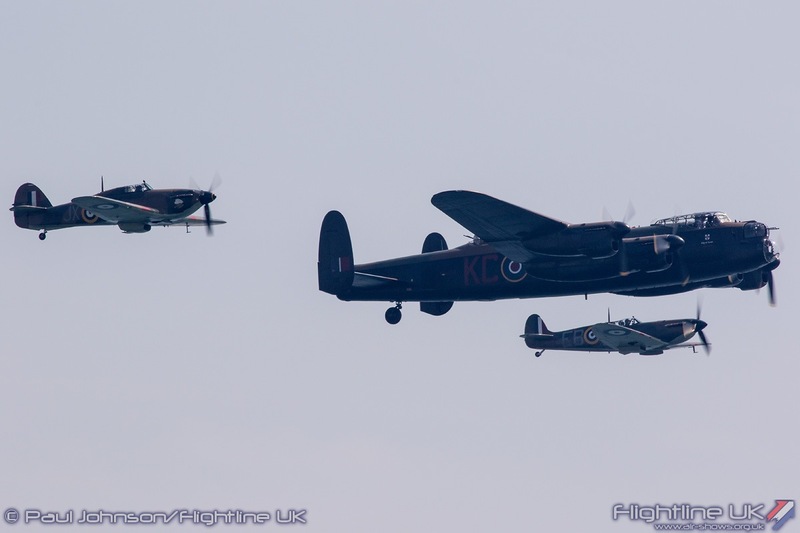 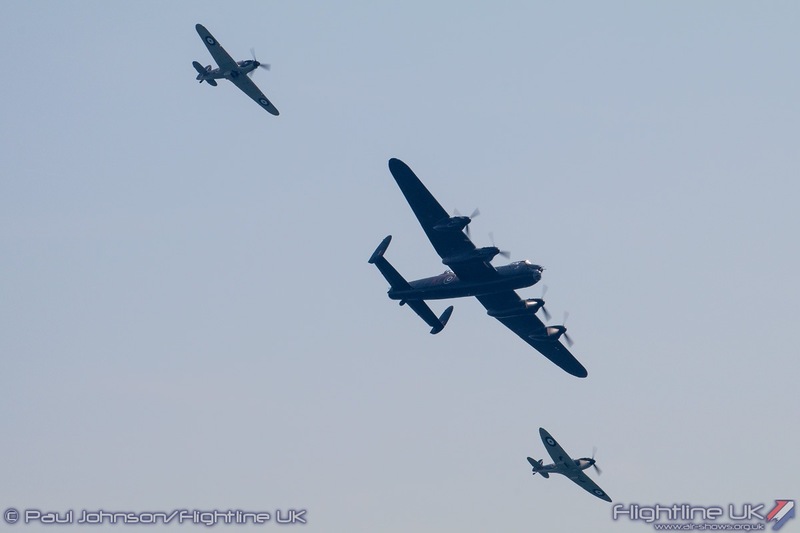 Completing the RAF contribution was the Battle of Britain Memorial Flight with the full complement of Avro Lancaster B1, Supermarine Spitfire II and Hawker Hurricane IIc. 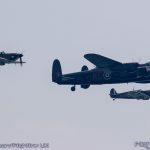 The threeship only appeared on the opening day because of the weather with solos from the Hurricane on Friday and the Spitfire on the Sunday. 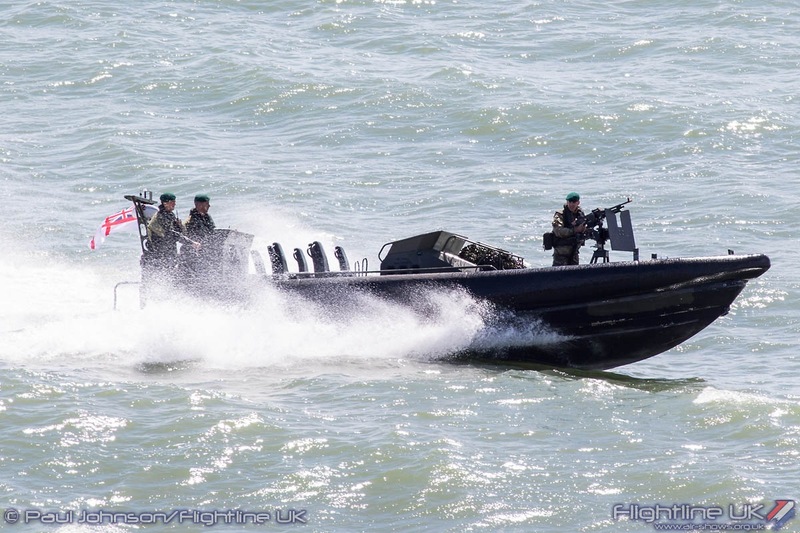 The British Army has a very limited presence on the display circuit at the moment. 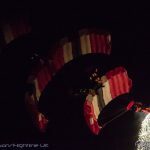 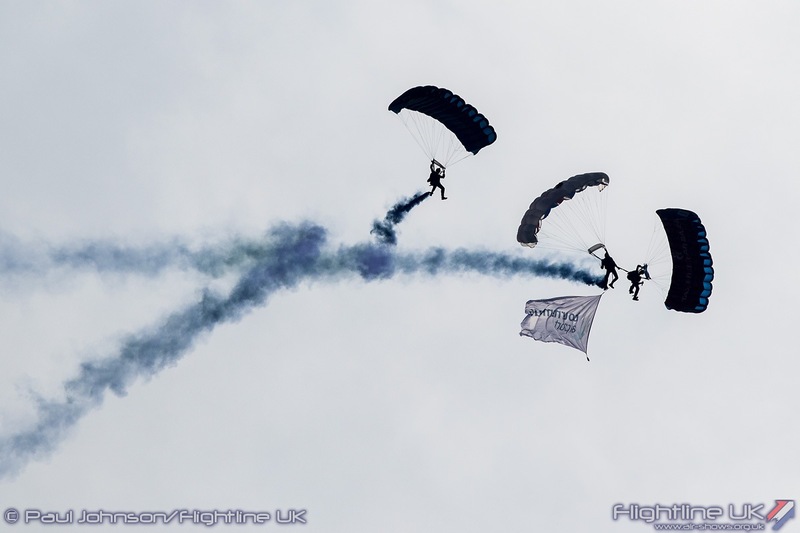 However, the members of the Tiger Freefall Parachute Display Team have proven to be superb ambassadors for the service. 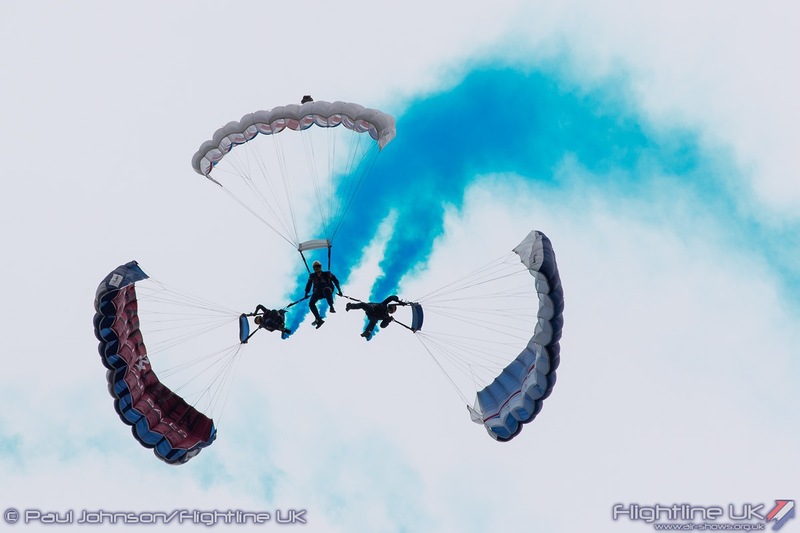 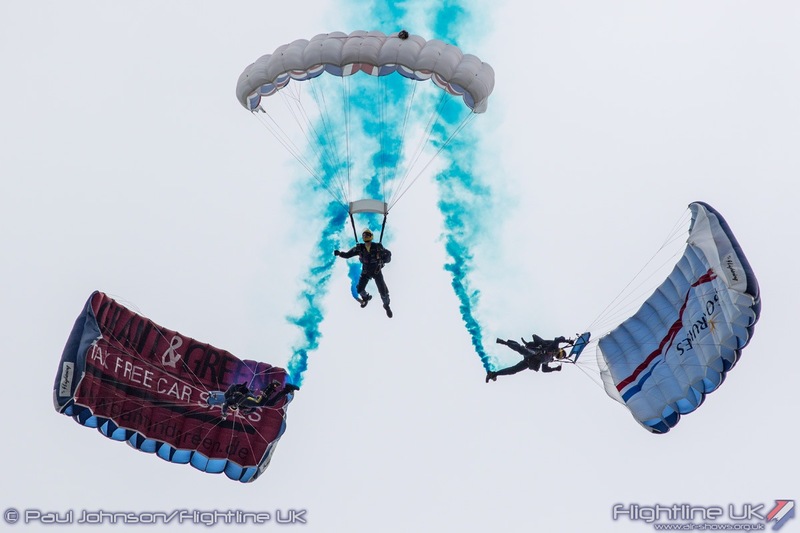 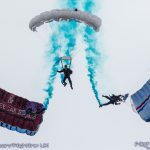 Drawn from the Princess of Wales Royal Regiment based at Paderborn in Germany, the team always enter in the spirit of the events they attend varying their displays each time they jump. 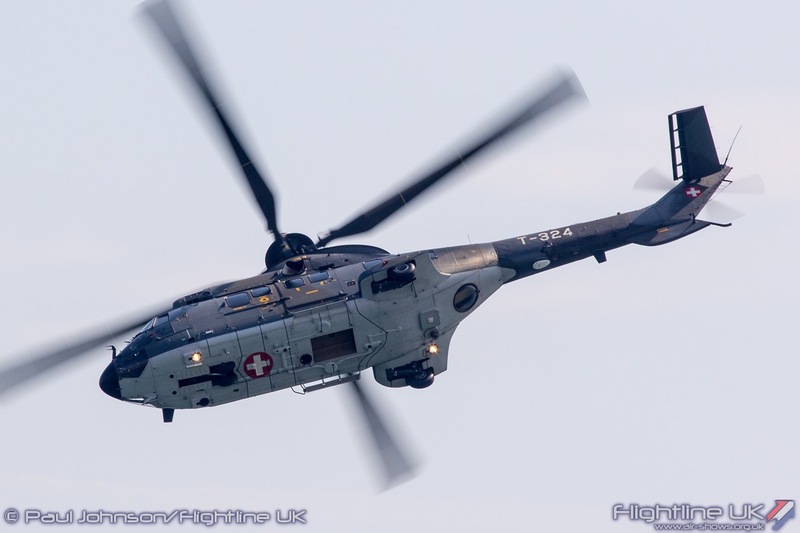 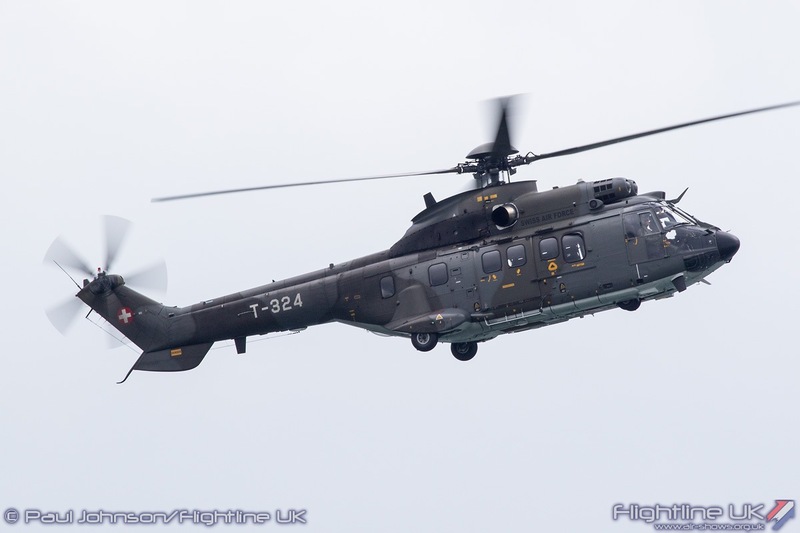 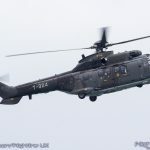 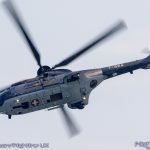 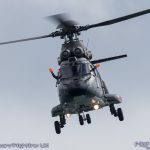 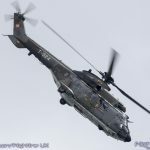 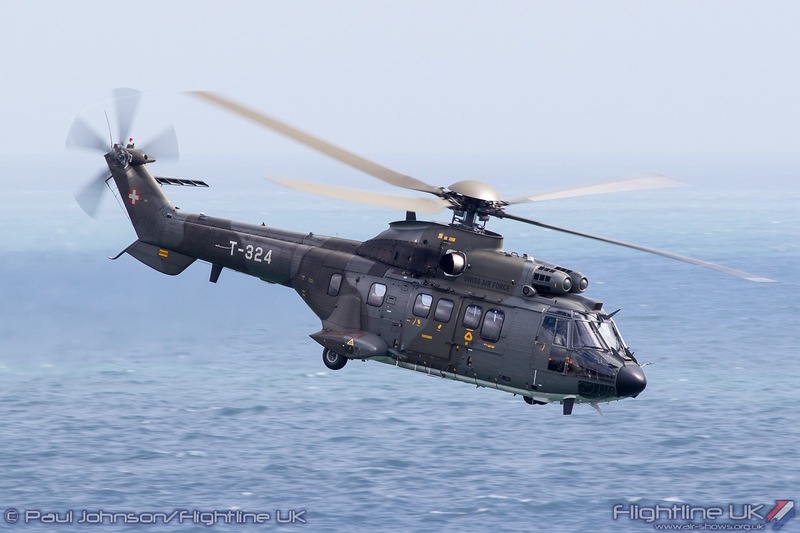 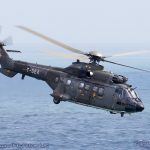 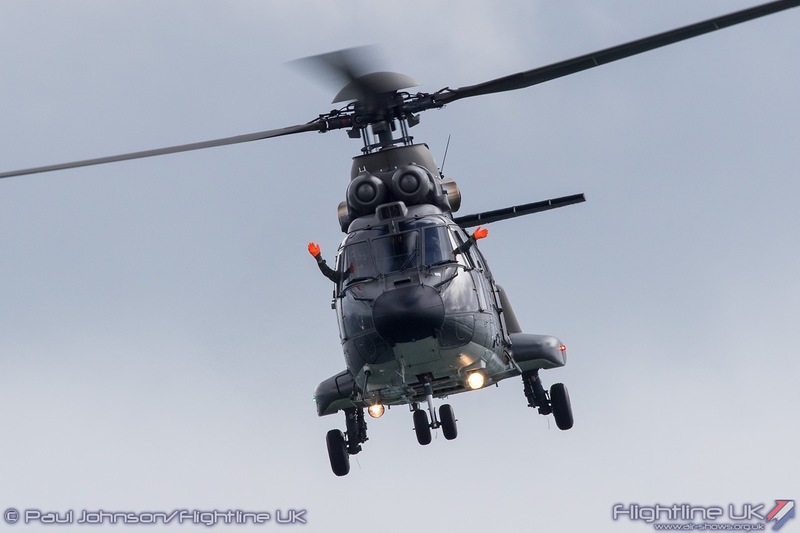 Joining the UK armed services this year was the Swiss Air Force presenting the Super Puma Display Team who fly the Airbus Helicopters AS332 Super Puma. 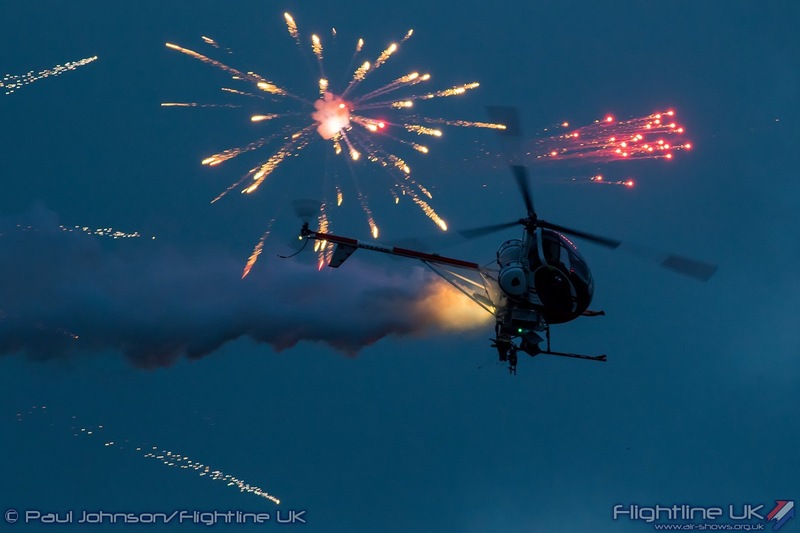 The team fly a very dramatic routine in the large helicopter which at times is nearly aerobatic and proved to be one one of the highlights of the Festival flying displays. 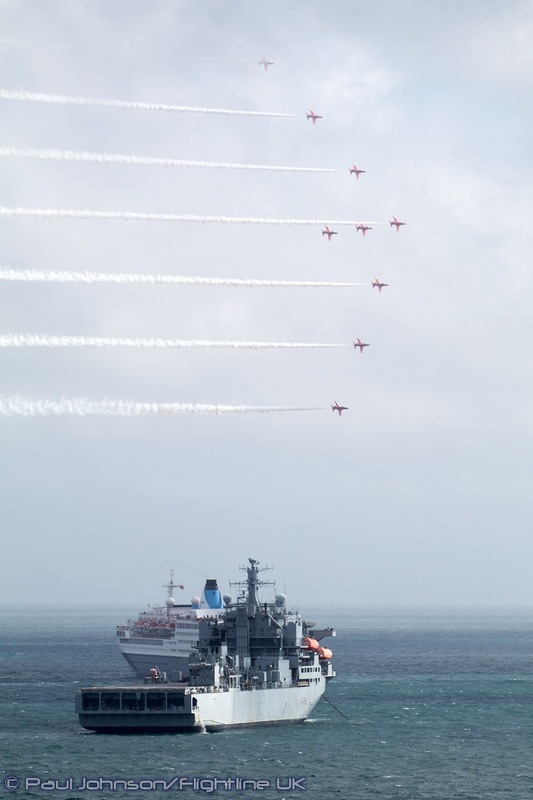 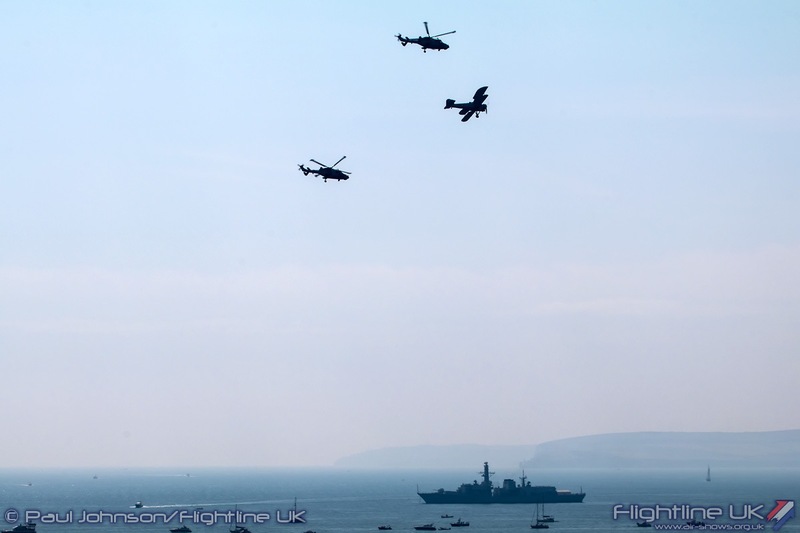 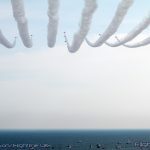 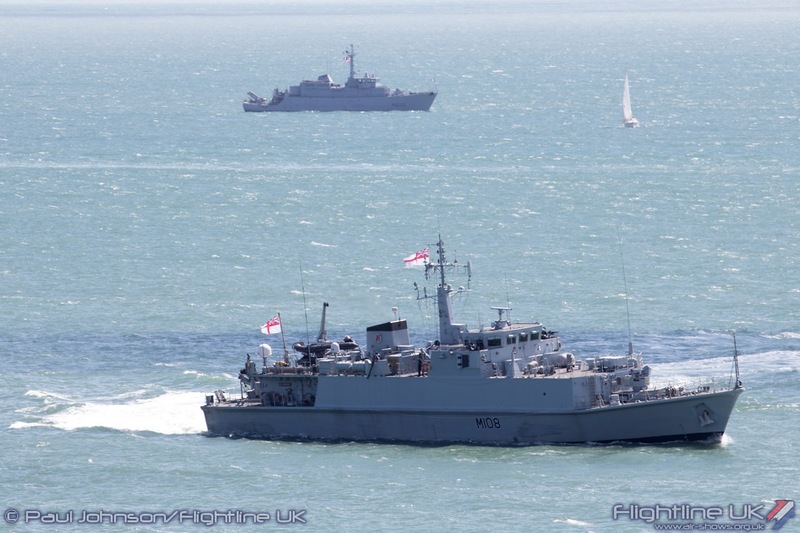 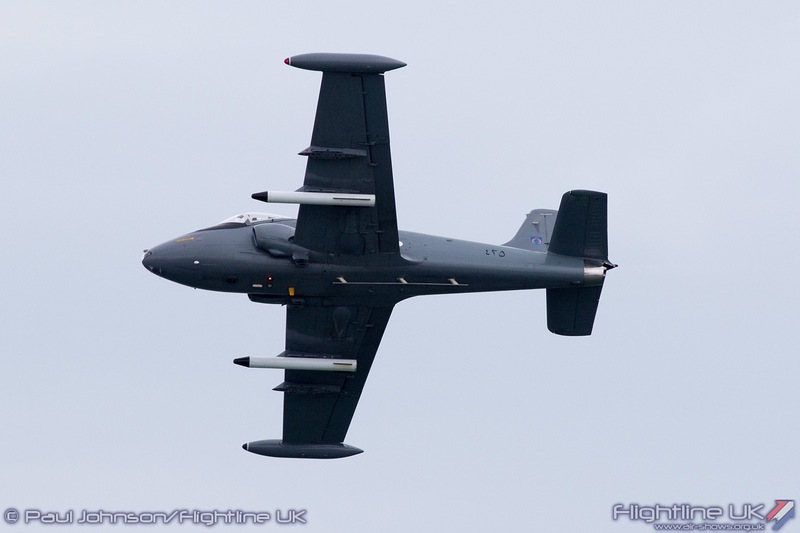 It was the first time is several years that Bournemouth has hosted international military participation (the last being the Dutch F-16 in 2010) and was the culmination of a lot of hard work and lobbying by the Air Festival organisers. 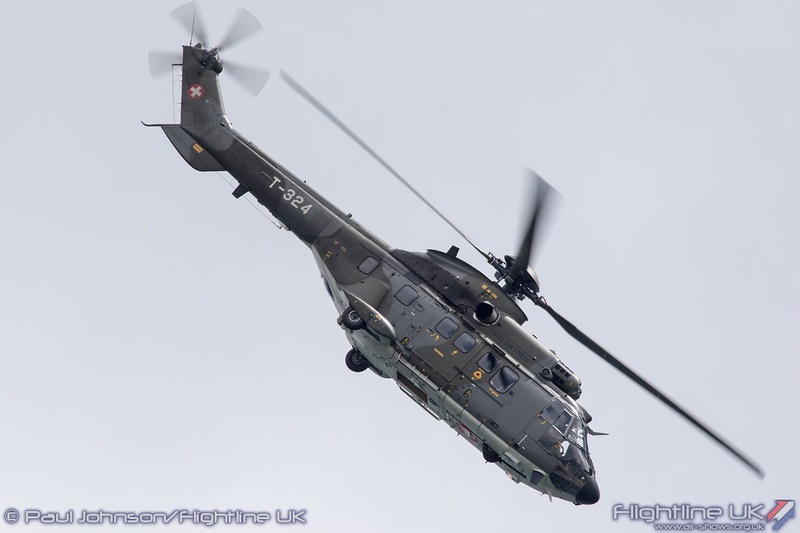 We hope the Super Puma teams appearance paves the way for more international participation at future Air Festivals. 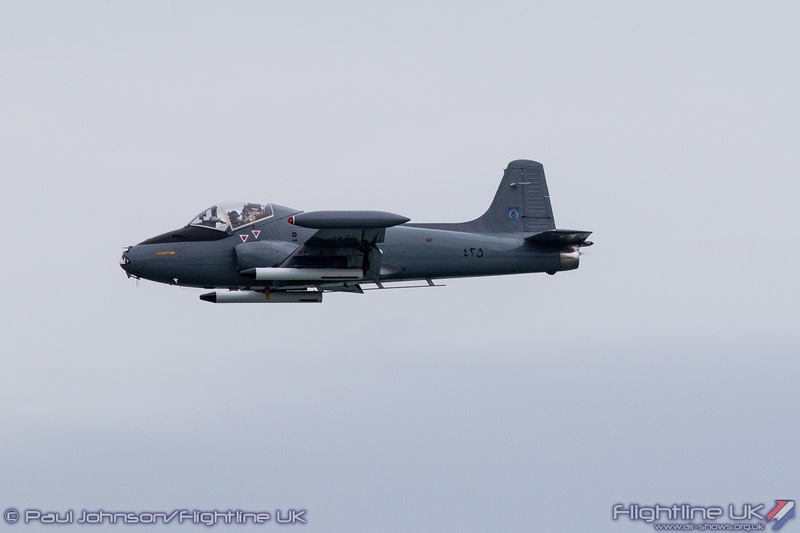 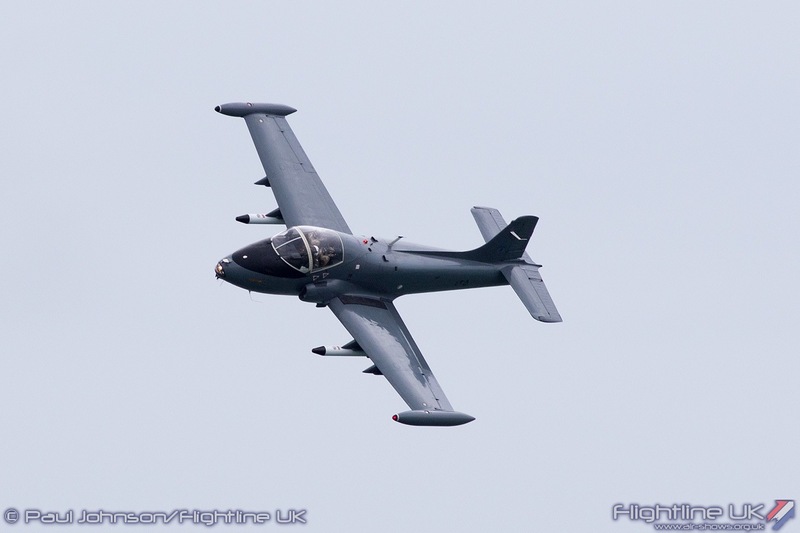 Carrying the baton for Classic Jets during the weekend was Mark Petrie flying his BAC Strikemaster Mk82a. 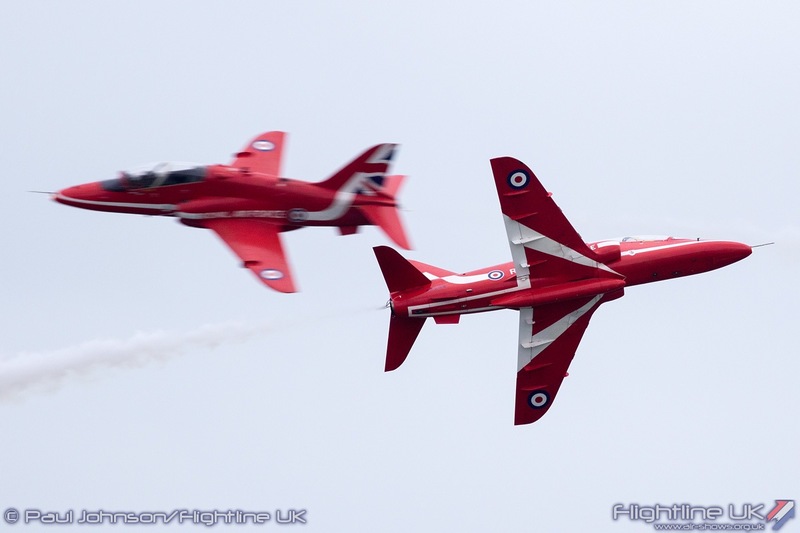 The aircraft wears the colours of the Royal Air Force of Oman and always looks immaculate. 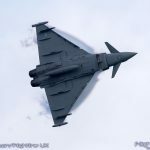 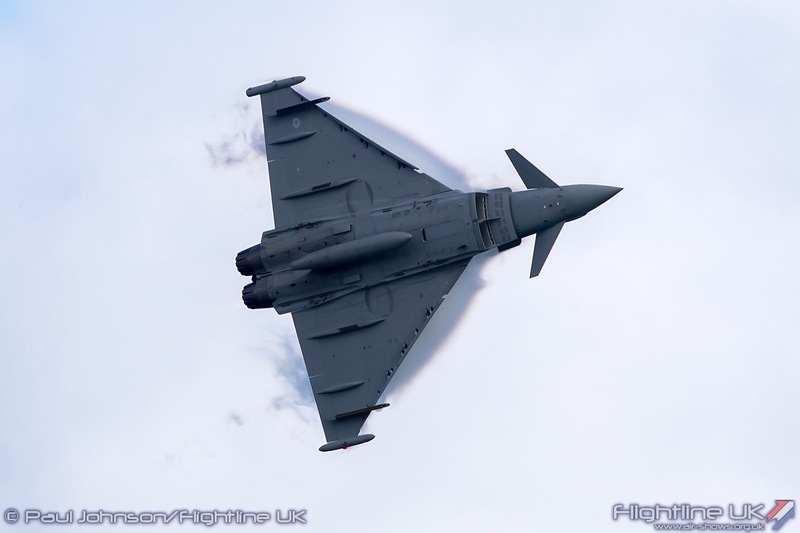 Mark’s routine highlights the lines of this classic product of the British aerospace industry as well as the noise from the Rolls Royce Viper turbojet. 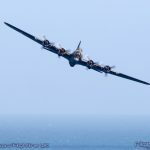 Boeing B-17G Flying Fortress Sally-B has been a regular attendee at Bournemouth and this year was scheduled to appear on all four days. 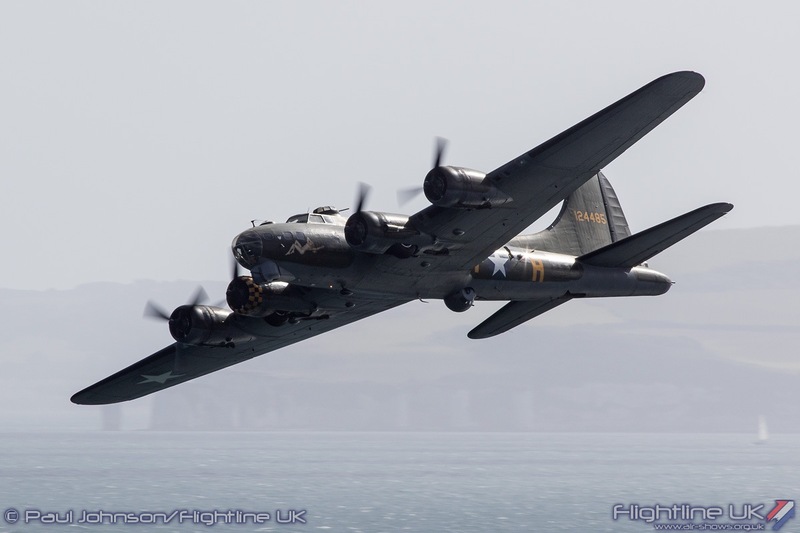 She is always an impressive sight at Bournemouth, particularly when framed against the cliffs of the Needles or the Isle of Purbeck that form the backdrop to the flying displays. 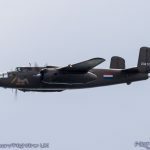 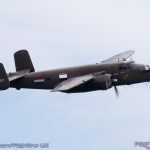 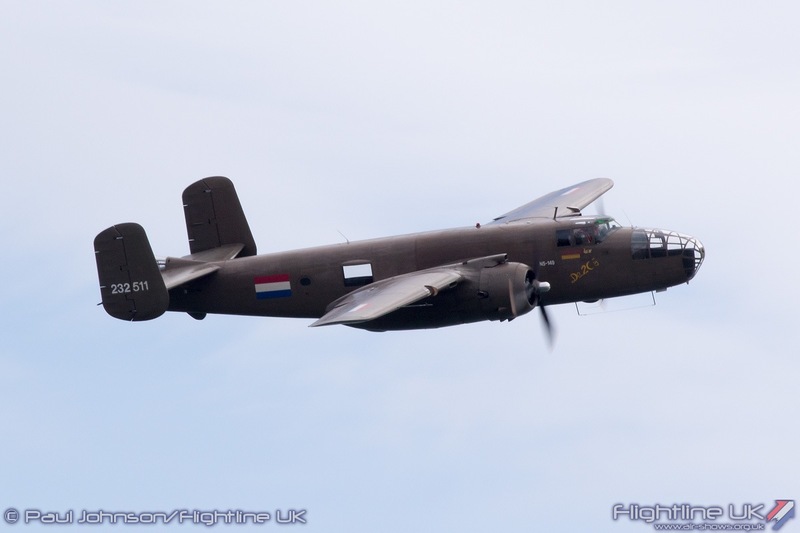 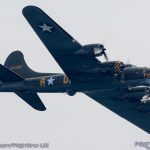 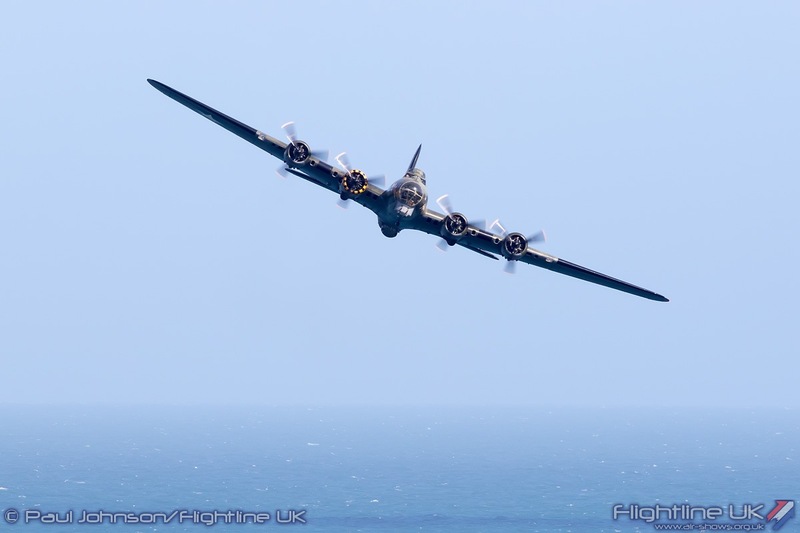 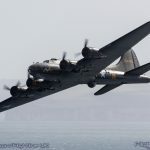 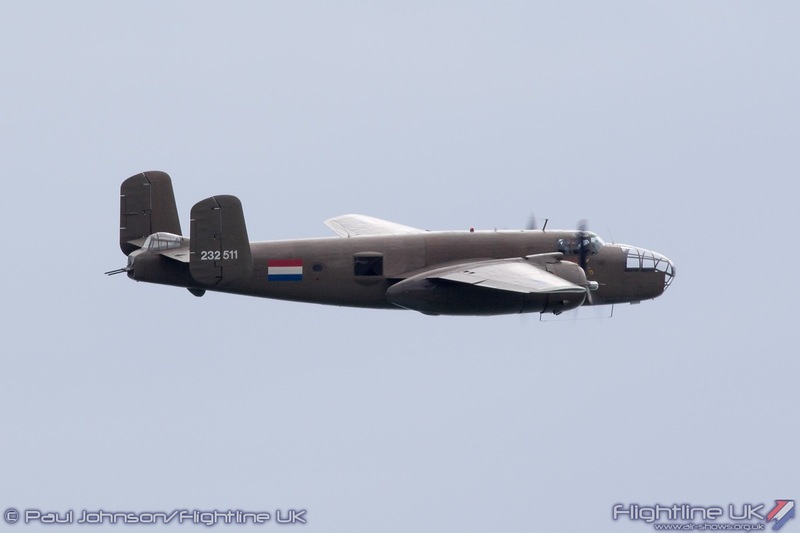 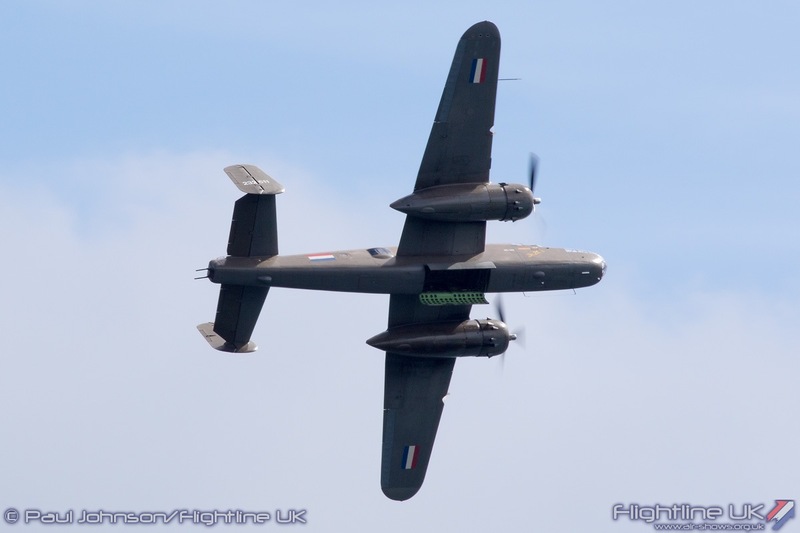 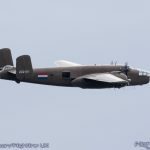 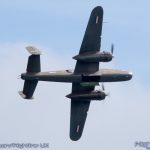 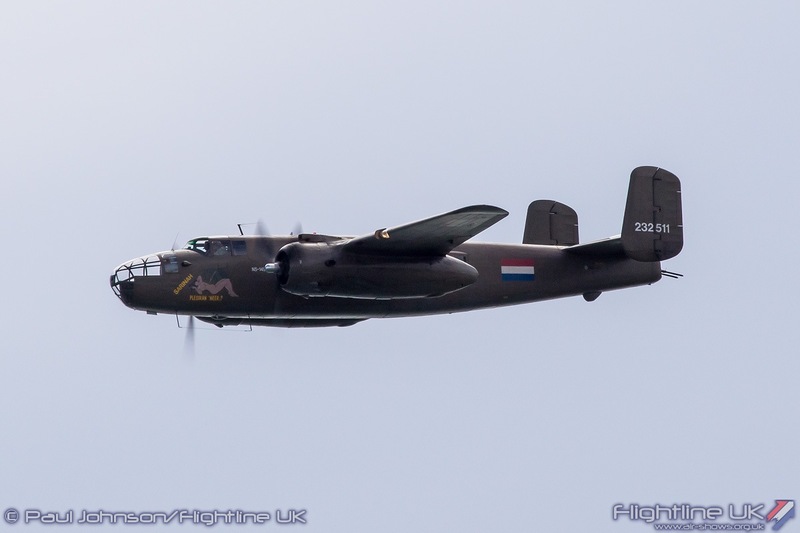 This year Sally-B was joined by another american bomber in the form of the Royal Netherlands Historic Flight’s North American TB-25N Mitchell which was making its Air Festival debut. 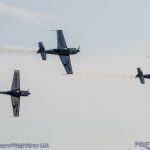 The Mitchell is always a very distinctive airshow performer with its unique sound and impressive agility that the Dutch crew show off so well. 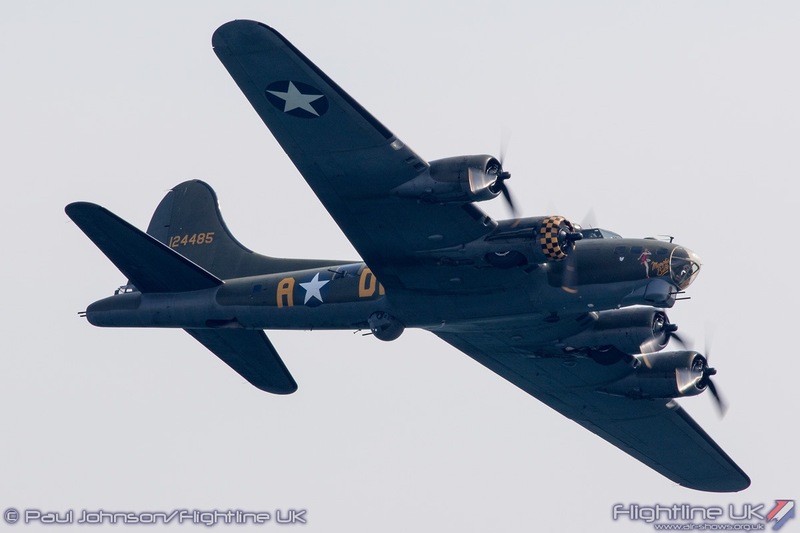 There were welcome returns for many Air Festival favourites. 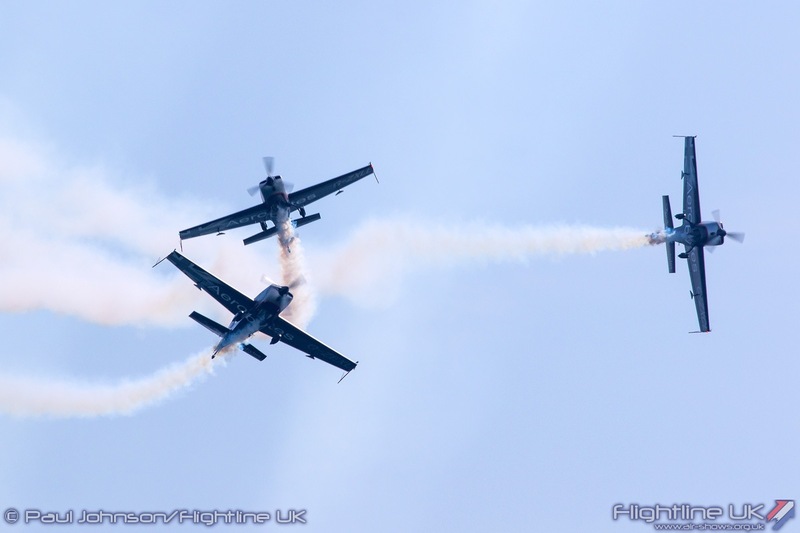 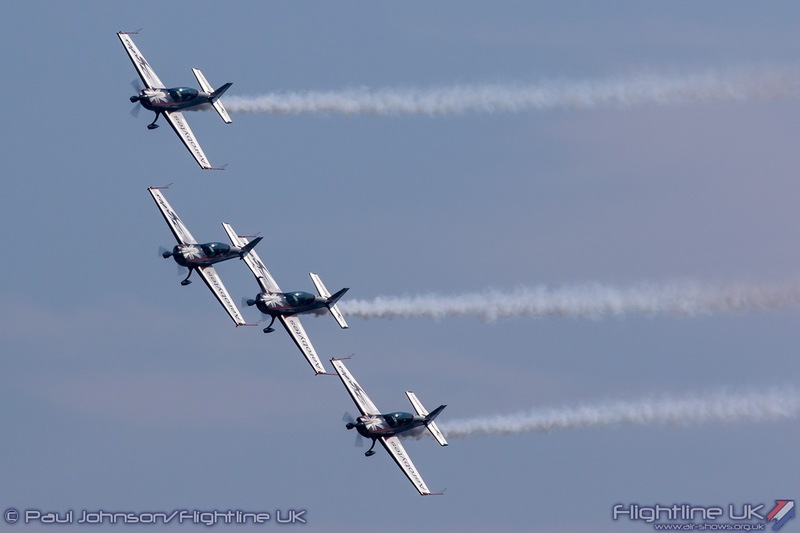 The Blades Aerobatic Team managed to fly on all four days despite having to put up with pretty trying weather. 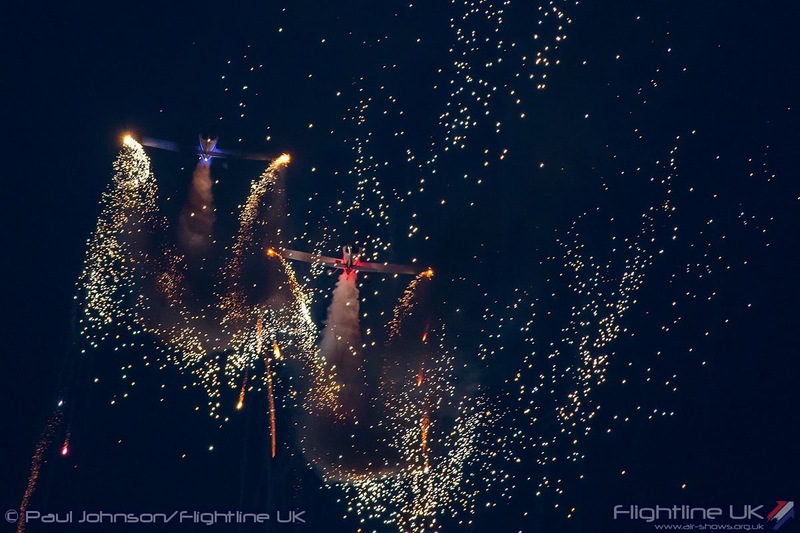 Their displays were all the more impressive as they remain as precise as ever. 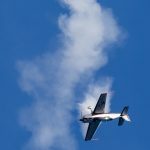 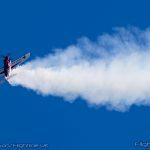 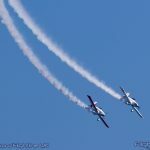 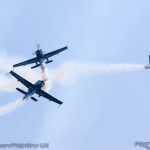 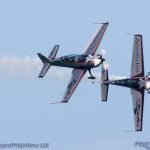 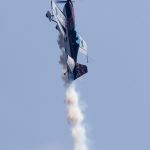 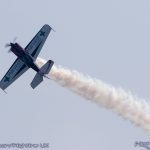 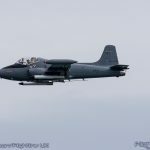 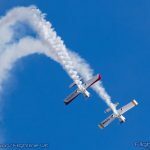 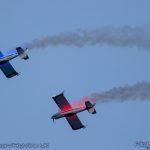 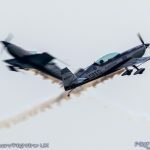 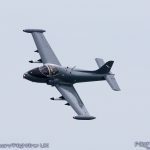 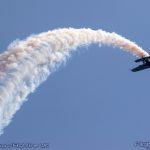 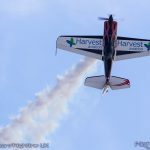 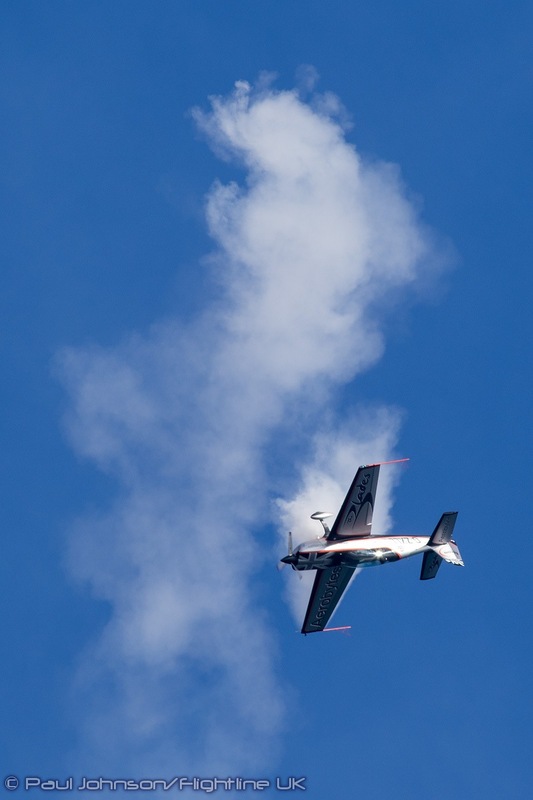 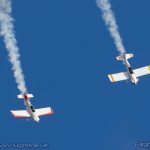 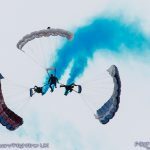 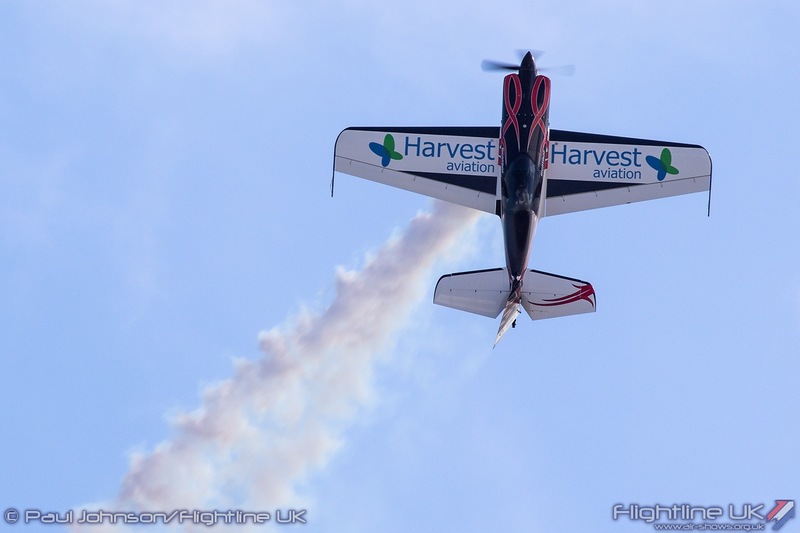 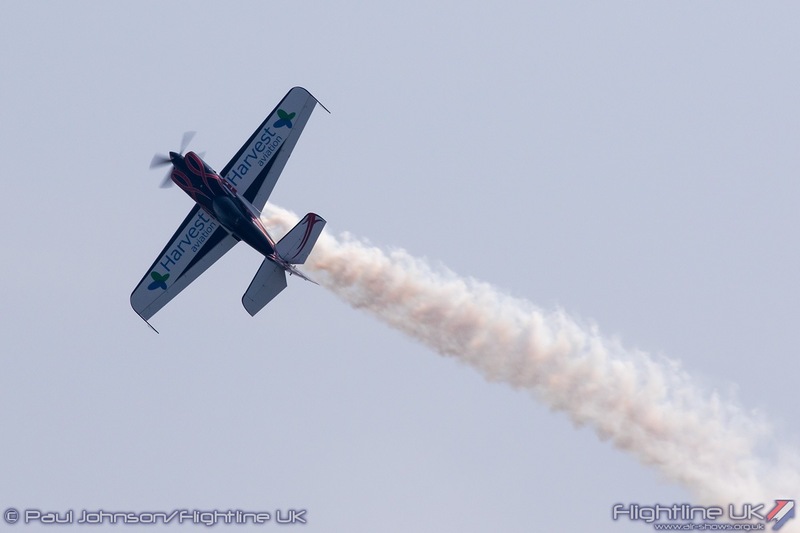 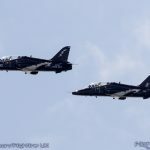 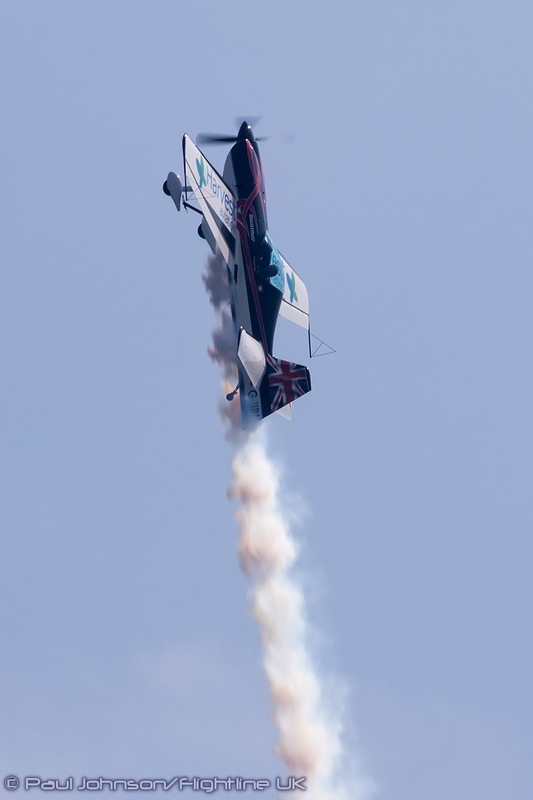 While the Blades profiled the very best in formation flying, Gerald Cooper’s solo displays in the XtremeAir XA41 showed off the art of freestyle aerobatic to wondrous effect on all four days despite the best efforts of the weather. 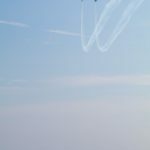 In Thursday’s fine summer weather, Gerald even took up some skywriting painting a huge “smilie” in the blue skies over the display area. 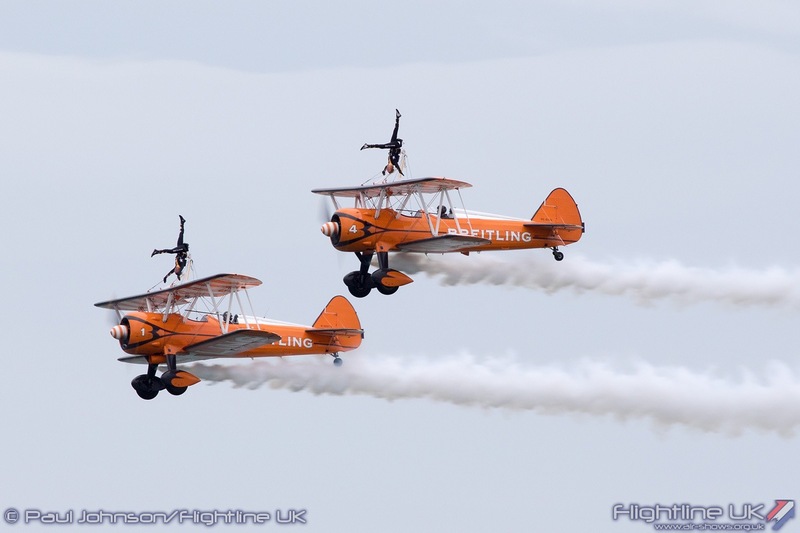 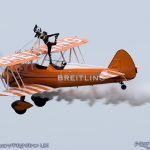 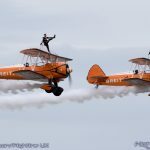 After an absence of three years, the Breitling Wingwalkers returned to Bournemouth. 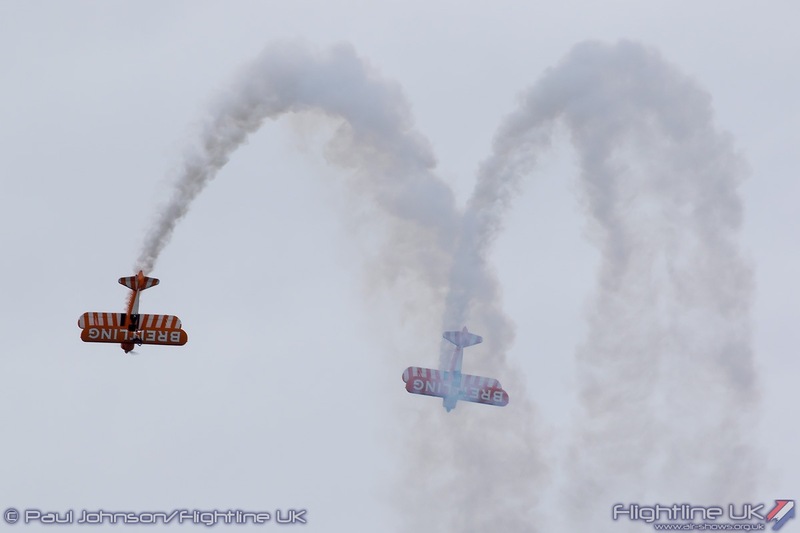 Sadly weather beat them on the Friday and Saturday, but they did make Sunday’s display. 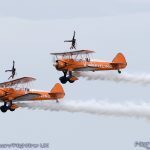 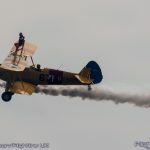 Pilots Steve Hicks and Al Hoy plus wingwalkers Nikita Salmon and Stella Guilding still had a battle with the winds though despite the much improved weather! 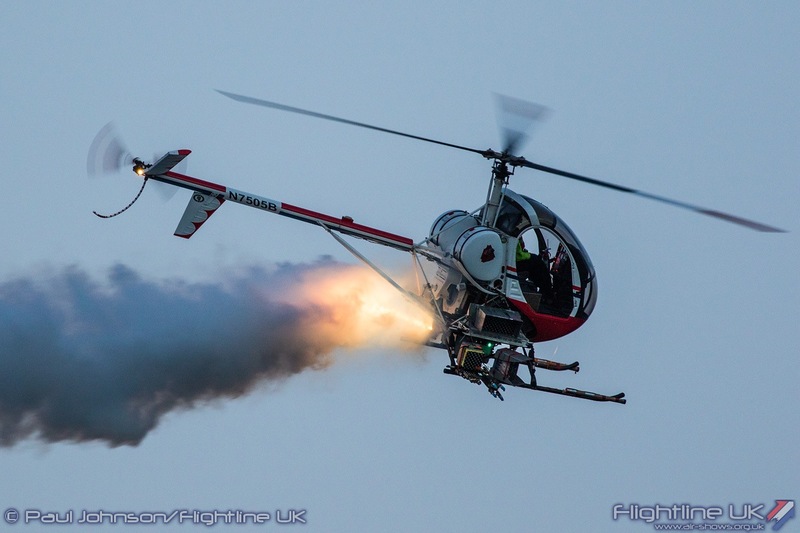 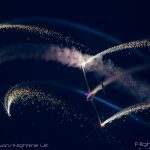 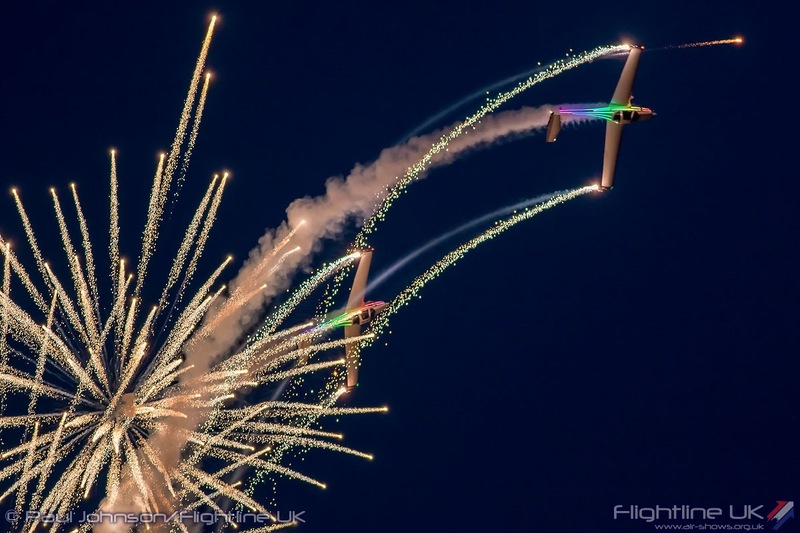 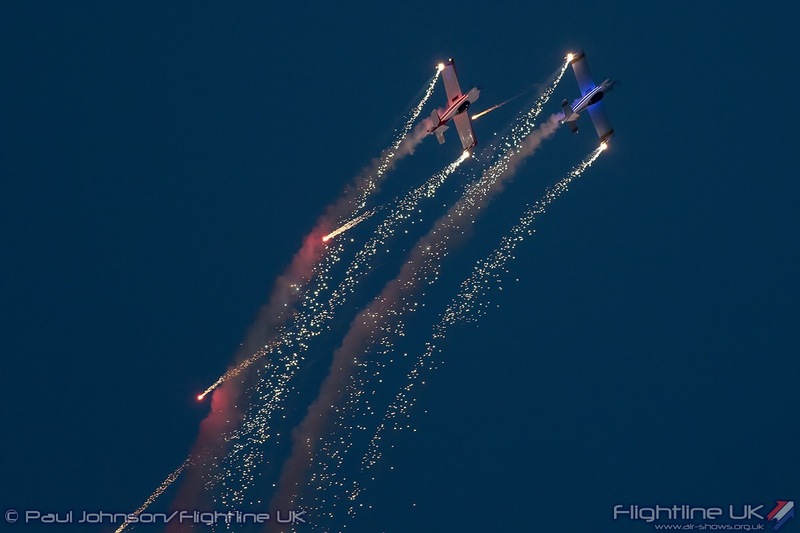 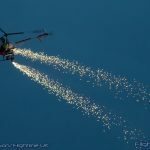 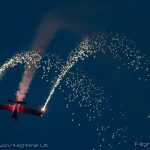 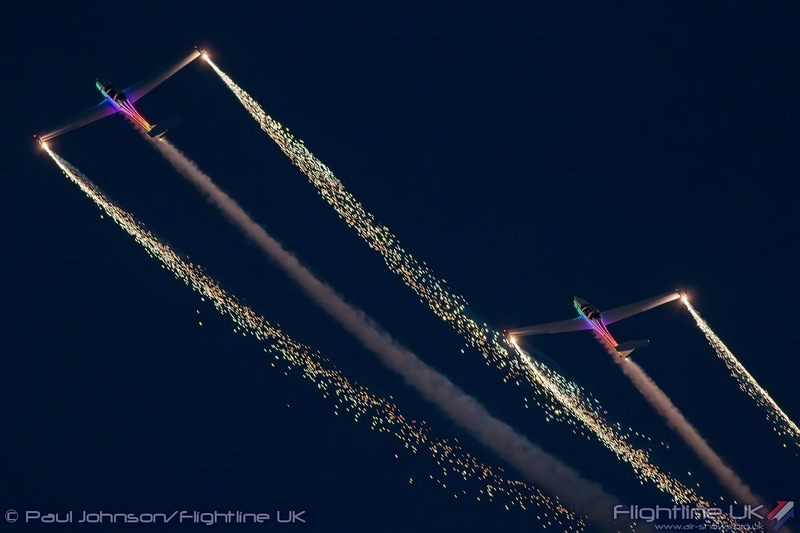 Bournemouth was one of the first events in the UK to introduce special dusk display acts during their Night Air Displays. 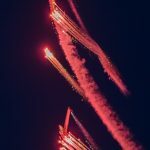 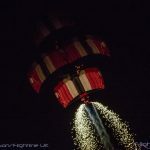 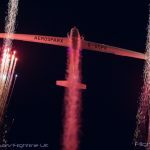 Sadly, weather prevented Saturday’s Night Air from going ahead, but both Thursday and Friday evenings were graced with spectacular pyrotechnic displays. 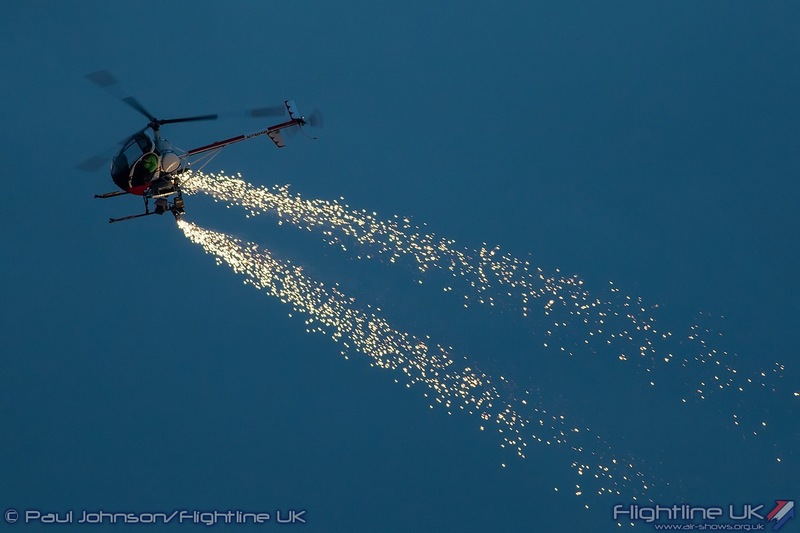 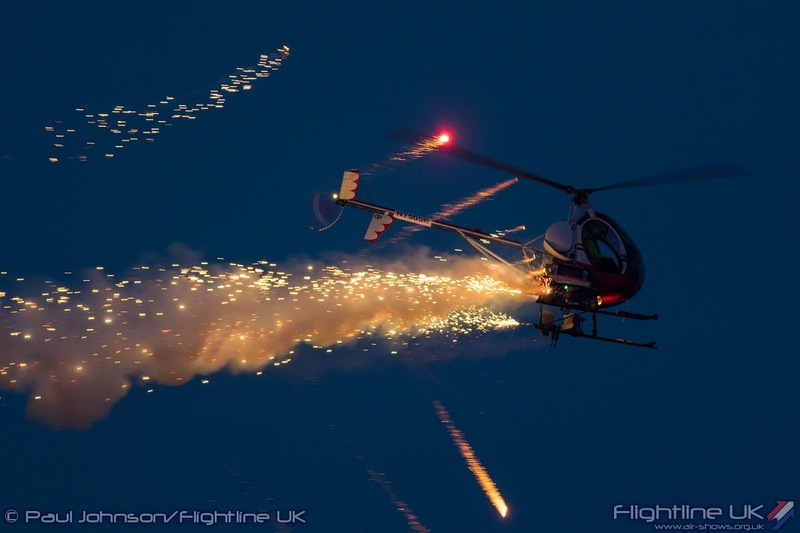 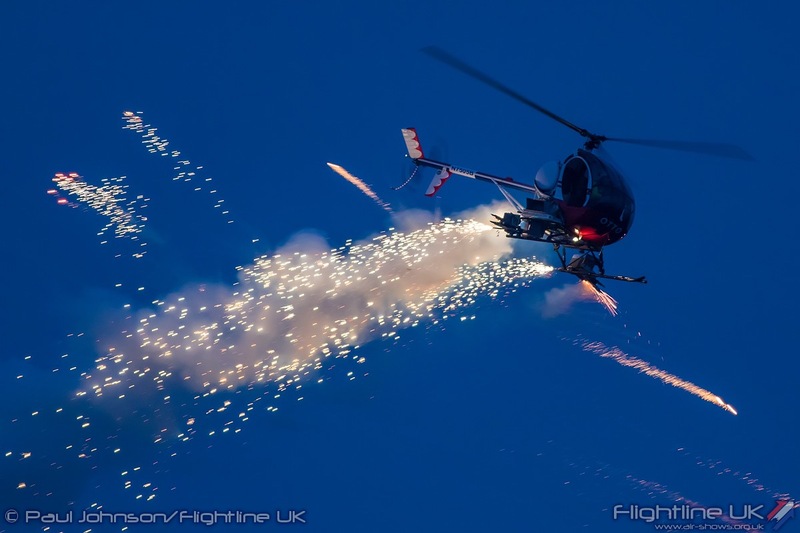 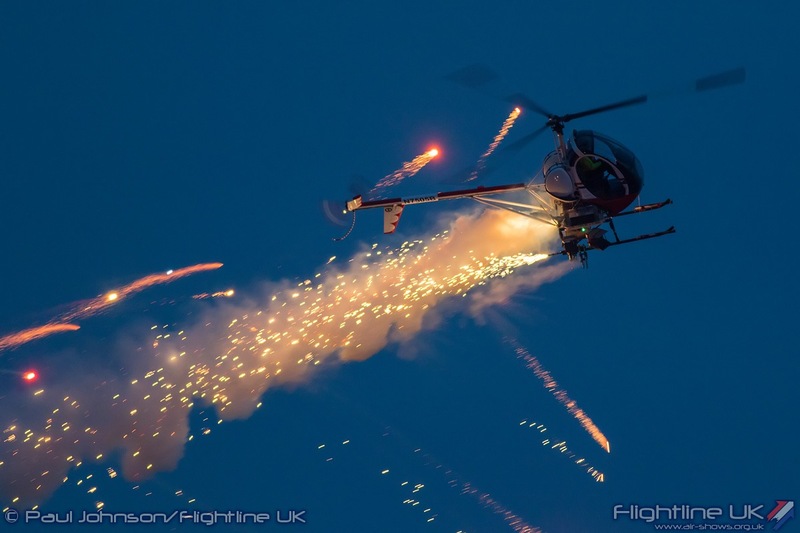 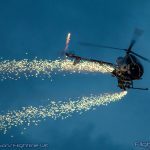 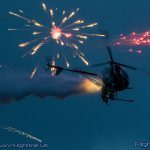 Opening the specialist pyrotechnic displays were an unusual pairing of the FireFlies Aerobatic Team and ‘OTTO’ the Helicopter. 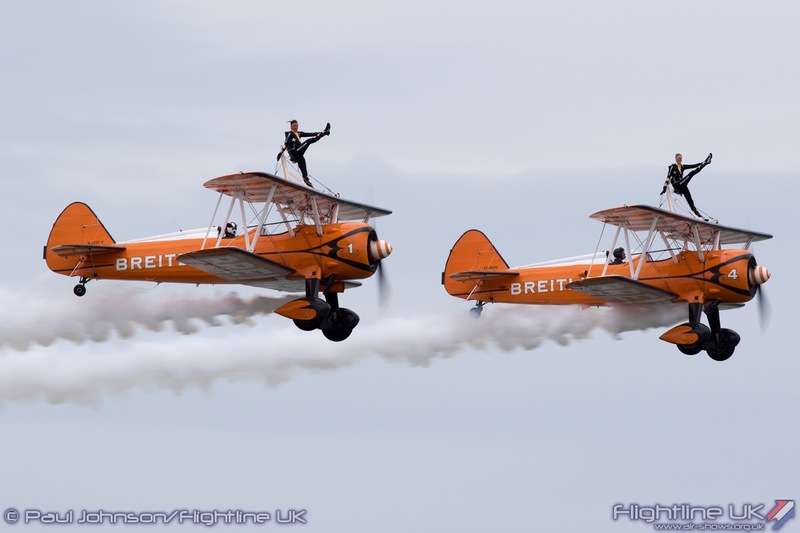 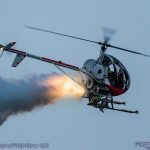 ‘OTTO’ is actually a Schweizer 300C and is legendary display act from the United States. 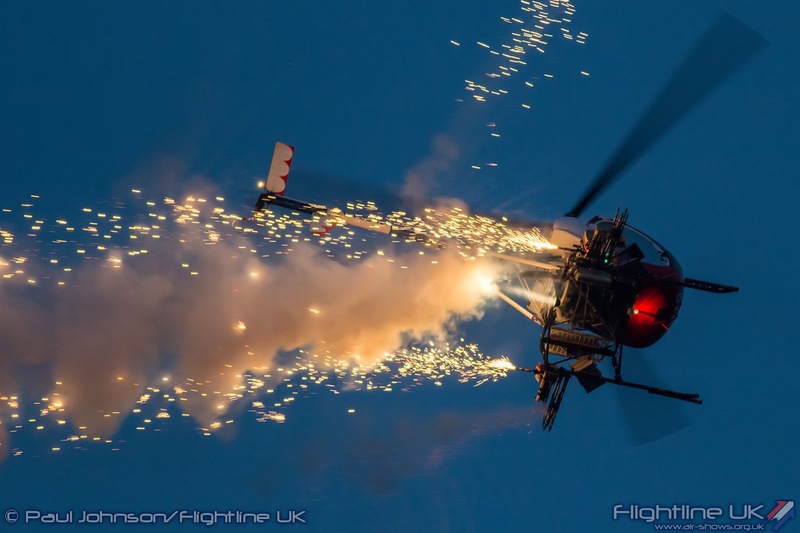 ‘OTTO’ was recently acquired by Brendan O’Brien who intends to keep OTTO’s legacy of Flying Circus alive on this side of the Atlantic with displays of ‘Chopperbatics.’ ‘OTTO’ is also well known for some spectacular pyrotechnic displays and his appearance at Bournemouth didn’t disappoint with an extravaganza of light and noise emanating from the helicopter’s minimal fuselage. 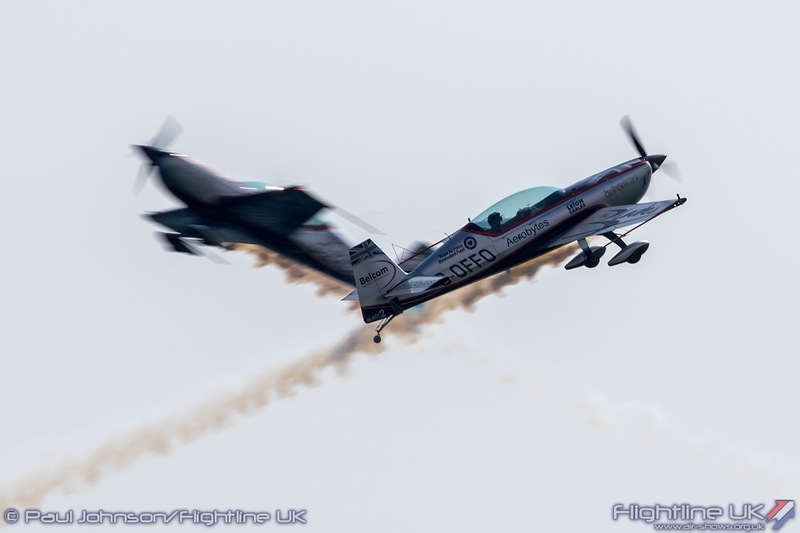 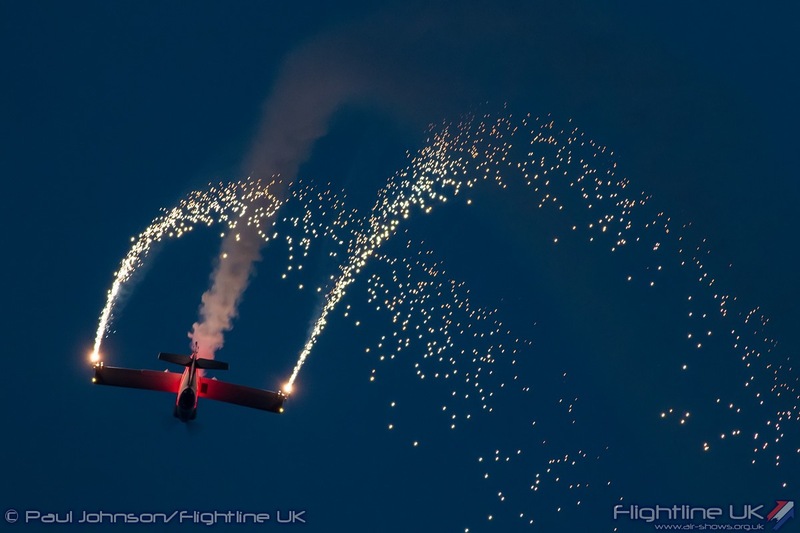 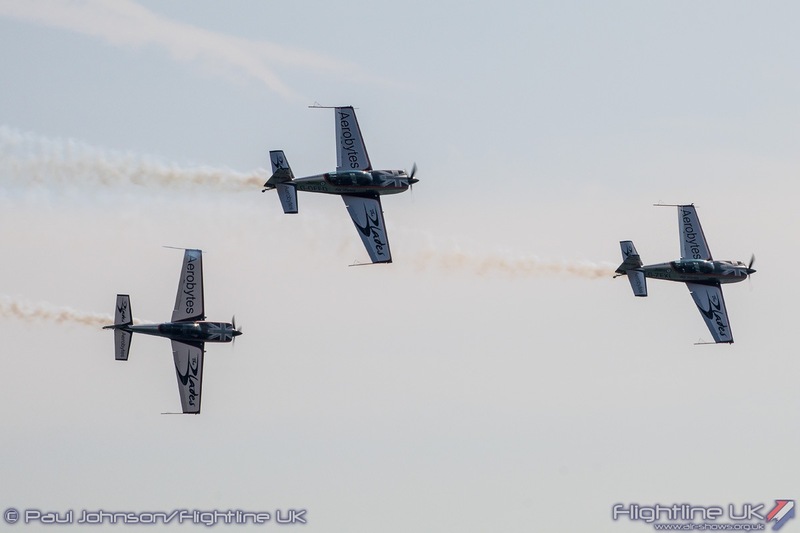 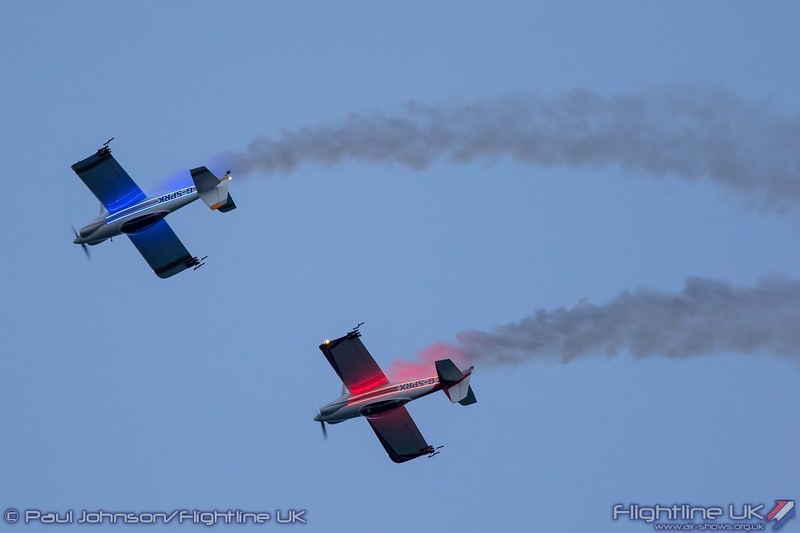 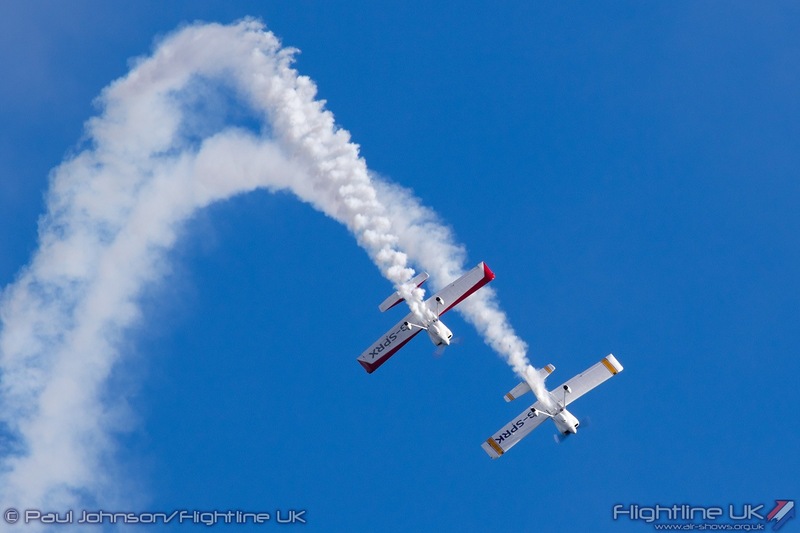 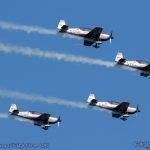 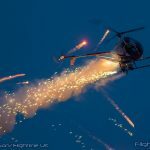 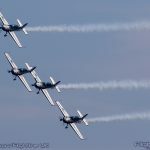 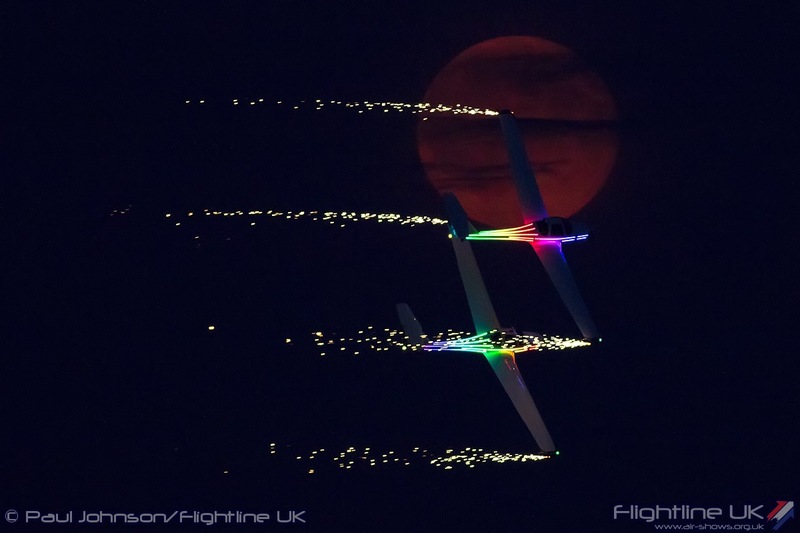 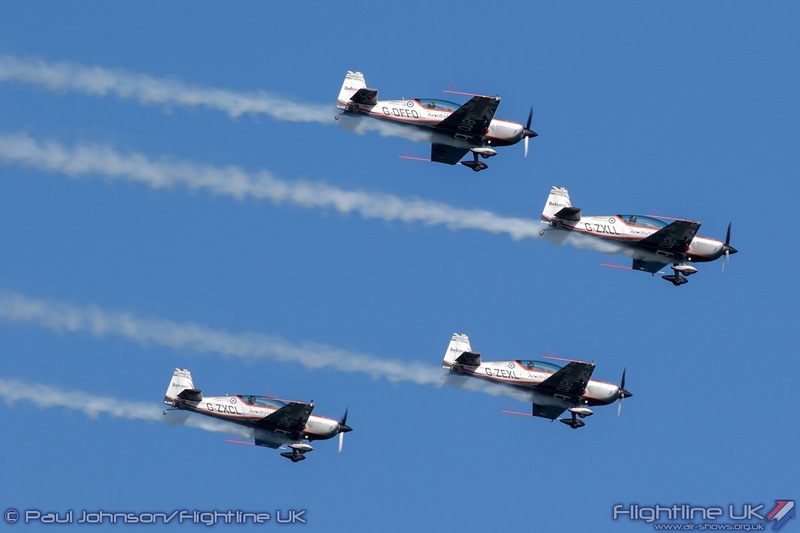 The Fireflies are one of the sharpest new acts on the display circuit combining the speed of their Vans RV4s with some very precise flying by both day and dusk. 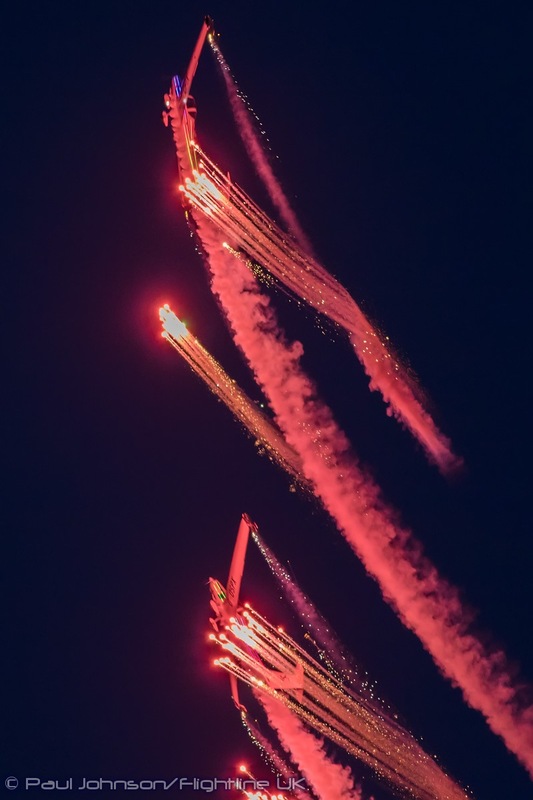 Like OTTO, they carry a varied selection of different fireworks on their wingtips to highlight their formation and synchronised aerobatics against the dark skies. 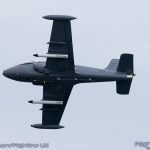 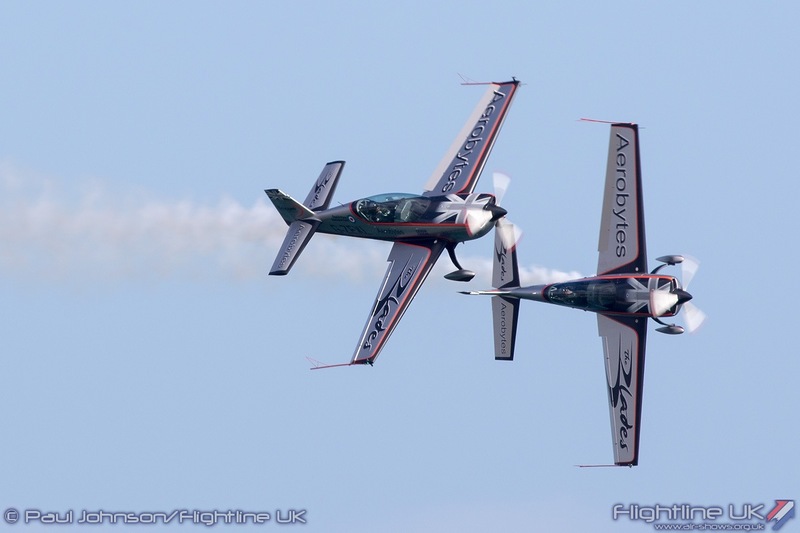 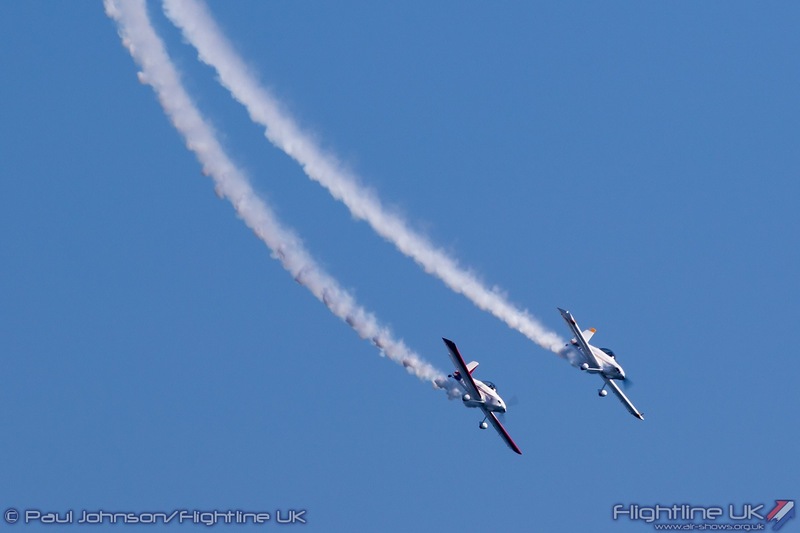 The AeroSPARX Display Team debuted at Eastbourne last year flying a pair of Grob 109b Motorgliders. 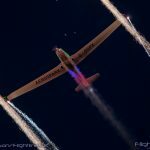 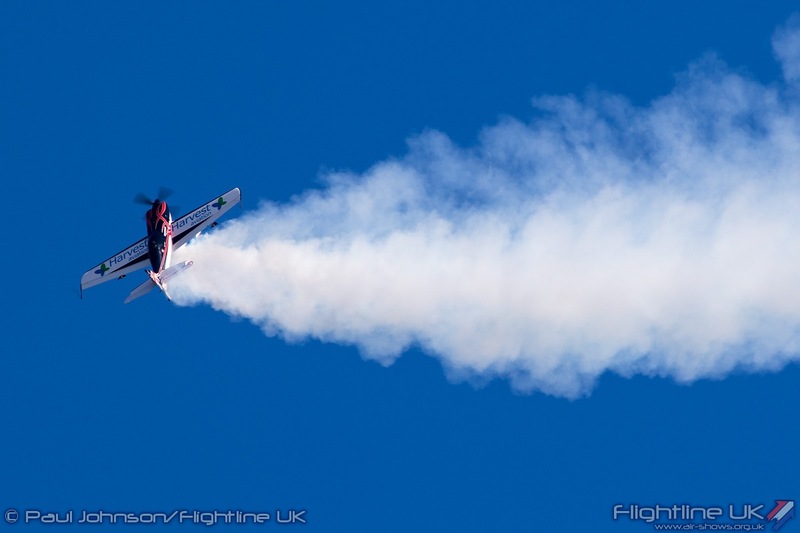 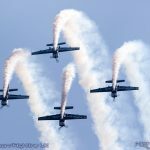 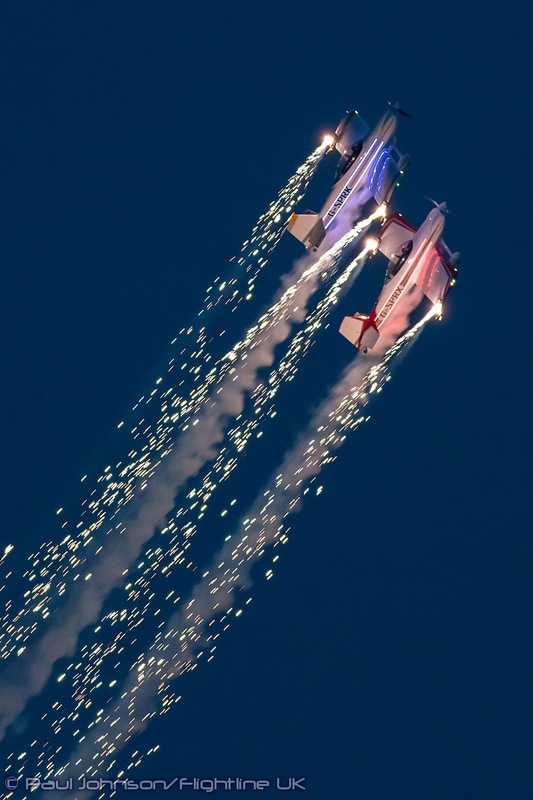 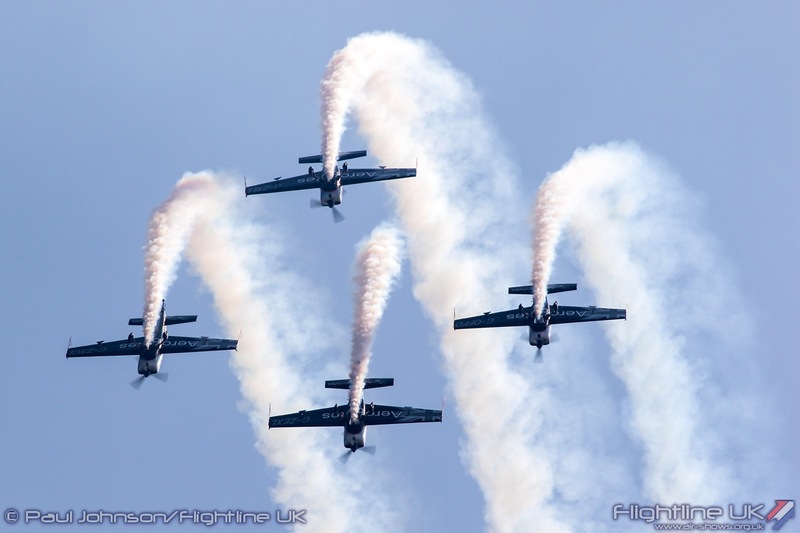 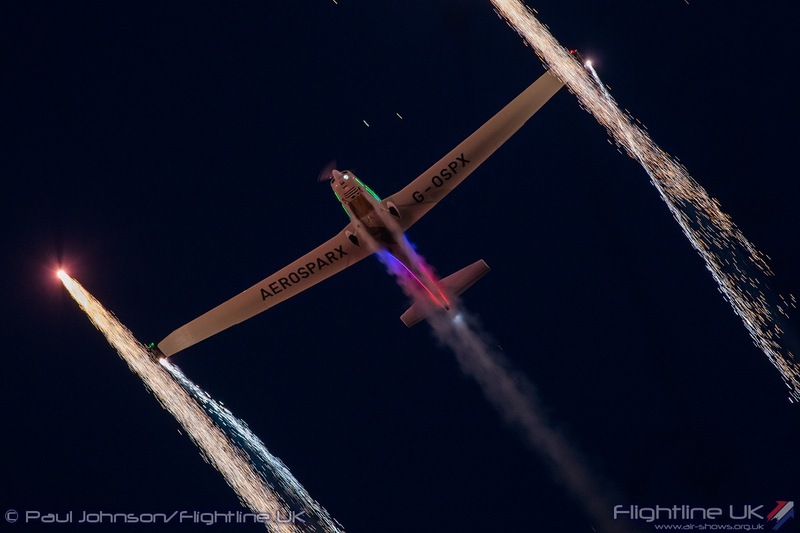 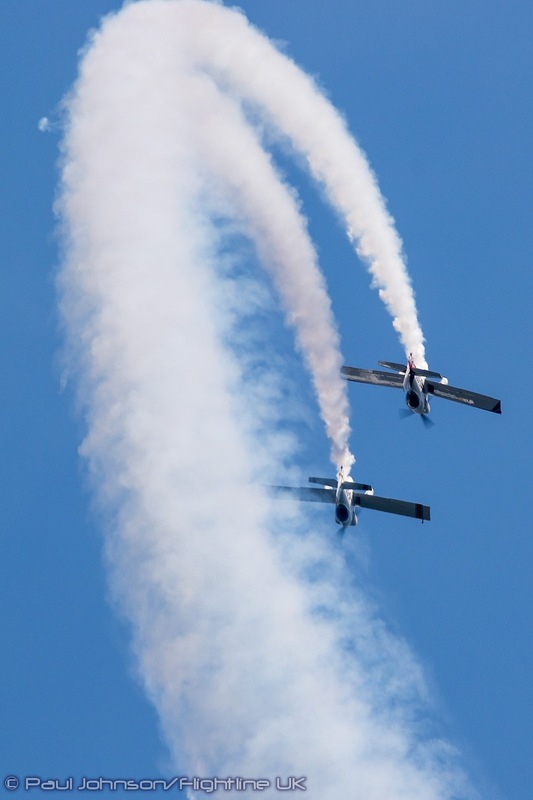 The team is led by “Mr Grob” Tim Dews who has modified and recertified the aircraft to permit them not only to fire pyrotechnic effects and carry LEDs, but also to fly aerobatics. 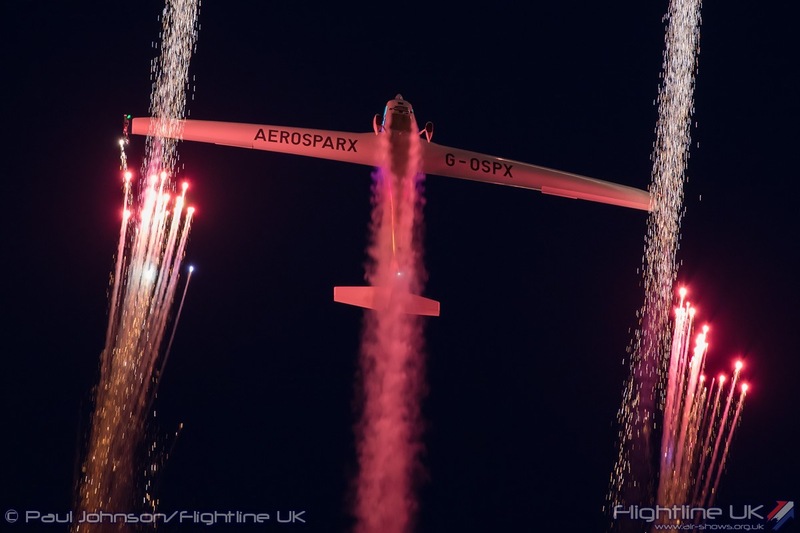 Tim is joined in the display by Guy Westgate who led some of the first ever pyrotechnic displays in the UK with his GliderFX Team. 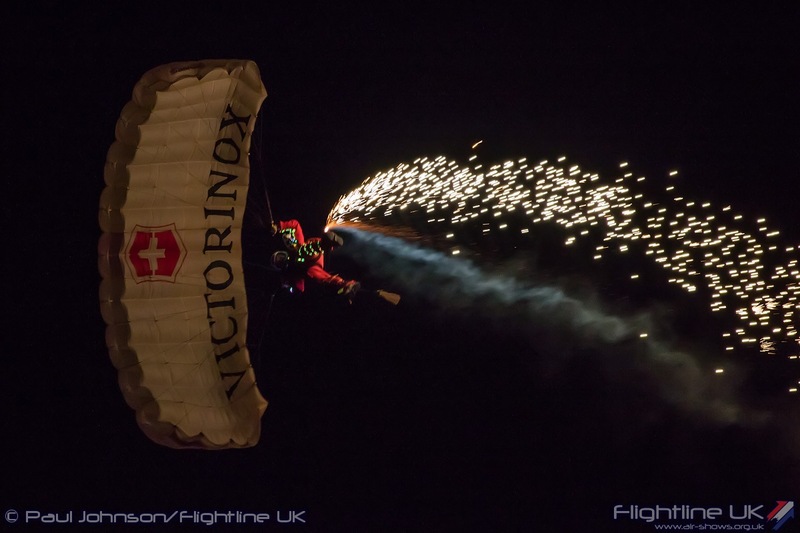 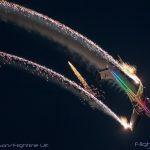 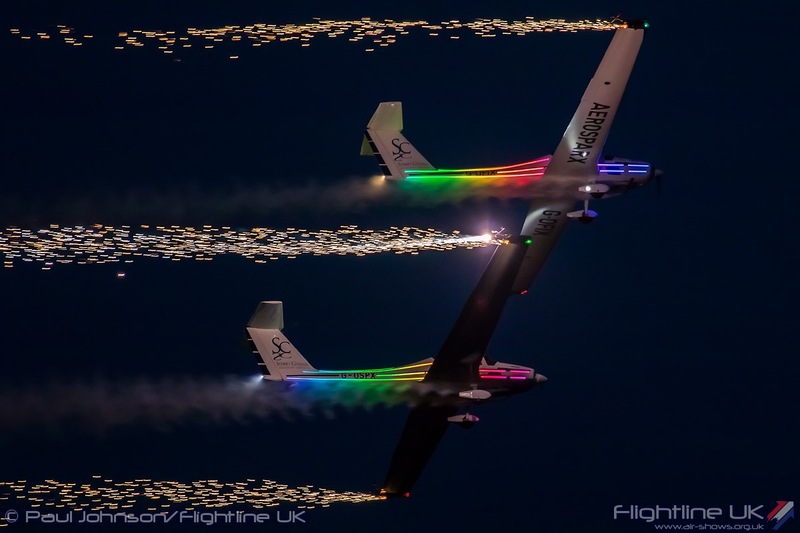 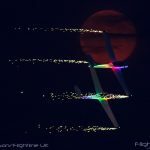 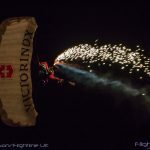 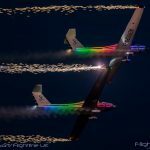 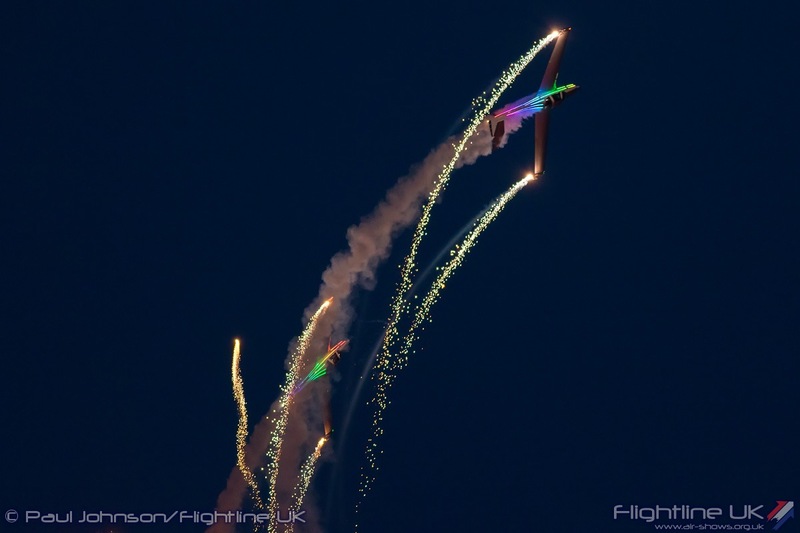 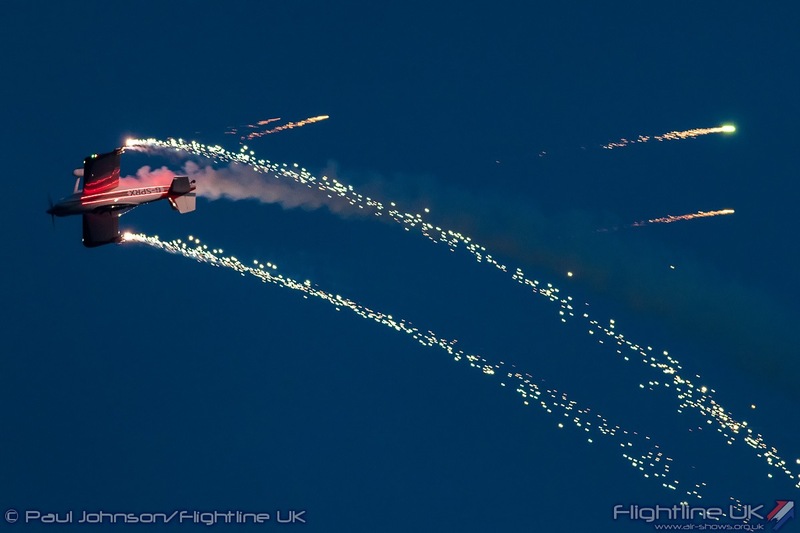 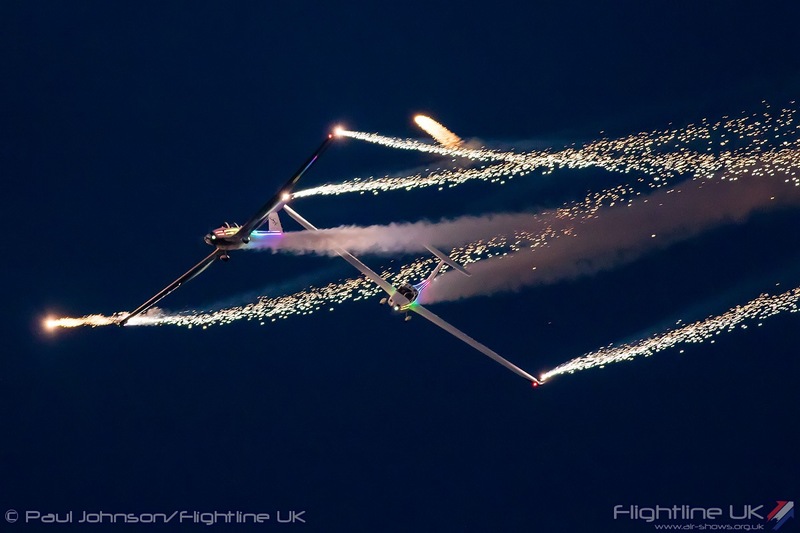 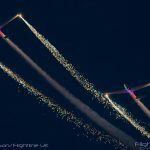 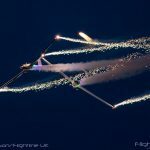 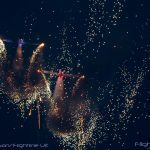 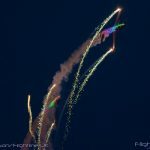 The team liken their display to painting with light with some very clever LED lighting on the side of their aircraft and a multitude of different fireworks streaming from their wingtips. 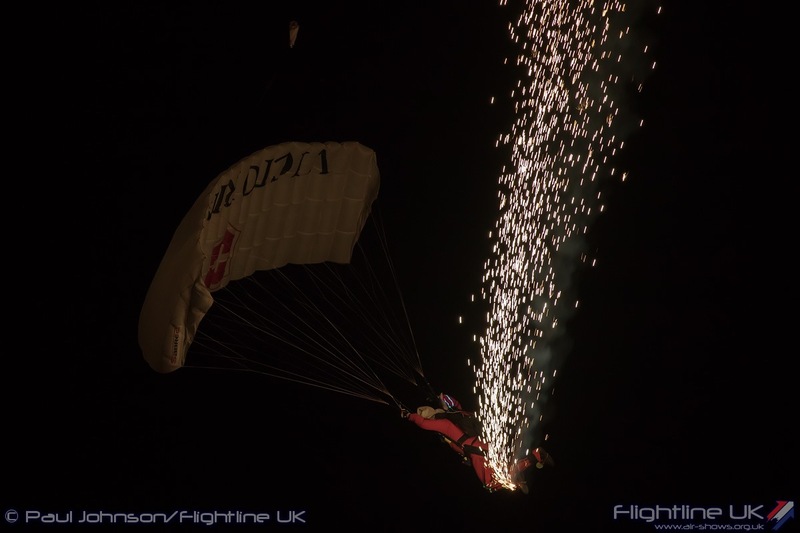 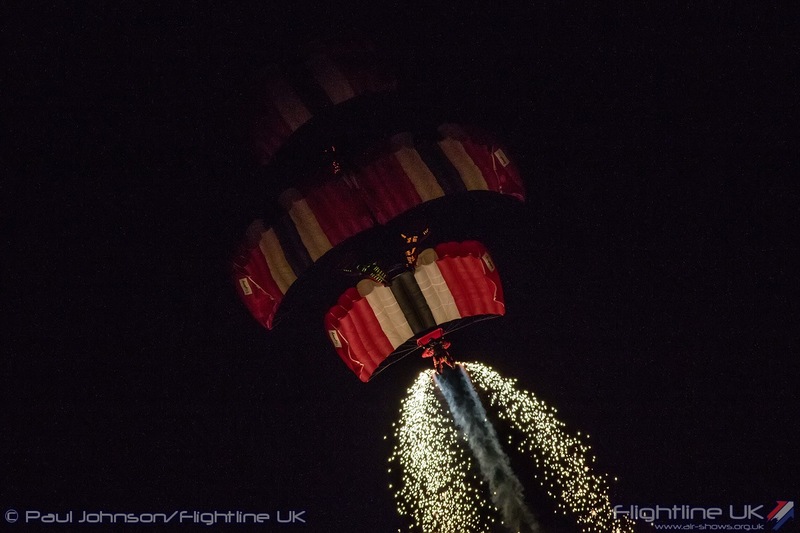 Thursday’s Night Air was closed by the British Army’s Red Devils Parachute Display Team from the Parachute Regiment. 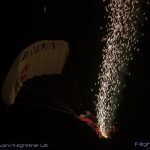 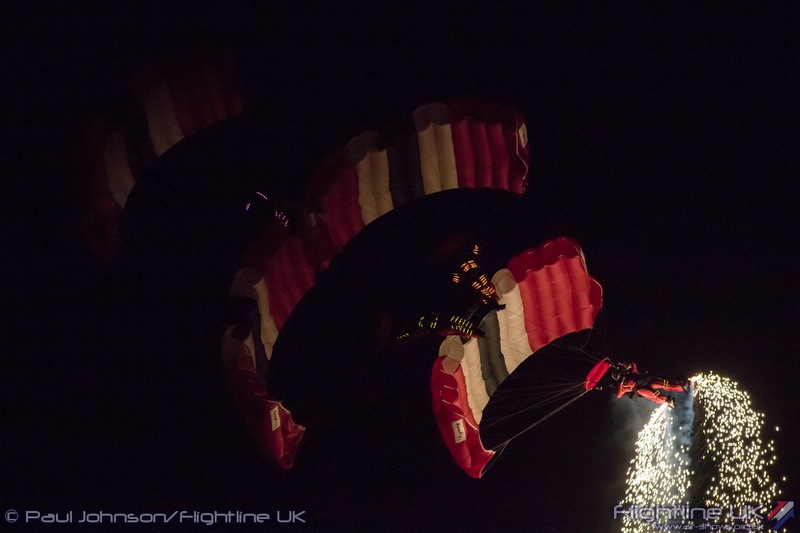 Jumping in the dark, the team use glow sticks and flares attached to their feet to highlight their amazing display. 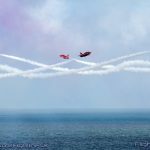 Despite the worst of the British Summer weather, Bournemouth Air Festival was a hugely enjoyable few days on the beautiful Dorset Coast. 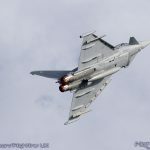 The Forecasts failed to put off spectators with over 700,000 estimated to have attended the show over four days with record crowds on the Thursday and Sunday. 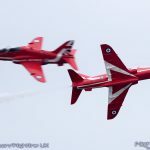 While it was slightly disappointing that the classic jet line-up was a little small this year compared to previous editions, it was certainly excellent to see further international participation and some new faces appearing at the show. 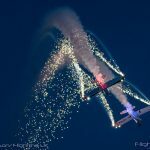 We hope this trend can continue into future Air Festivals, particularly for next year which will be the 10th Air Festival. 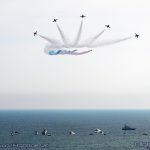 Praise must go to all the participating display crews and to the Air Festival’s flying control team for showing such flexibility and determination to get flying entertainment on all four days despite the poor conditions at times. 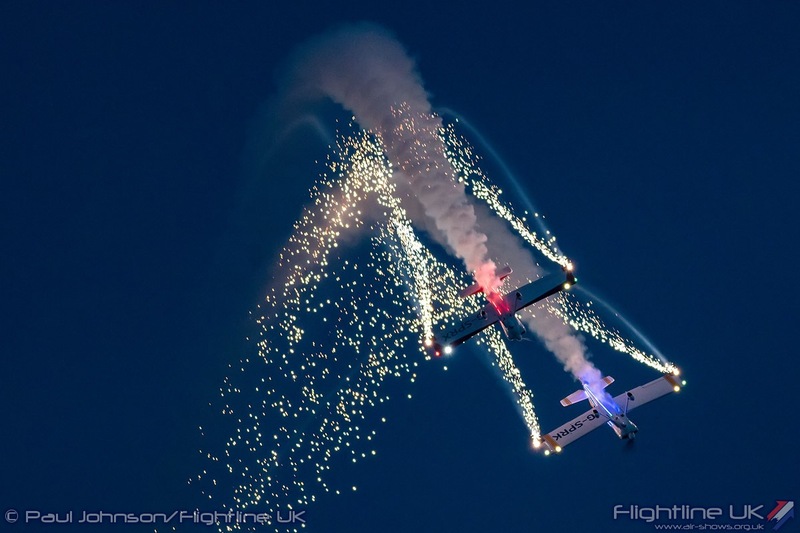 The Air Festival returns next year between the 31st August – 1st September and we cannot wait.